Honey and Velvet Mesquite Trees can take the extreme heat and the cold! This tree grows fast. 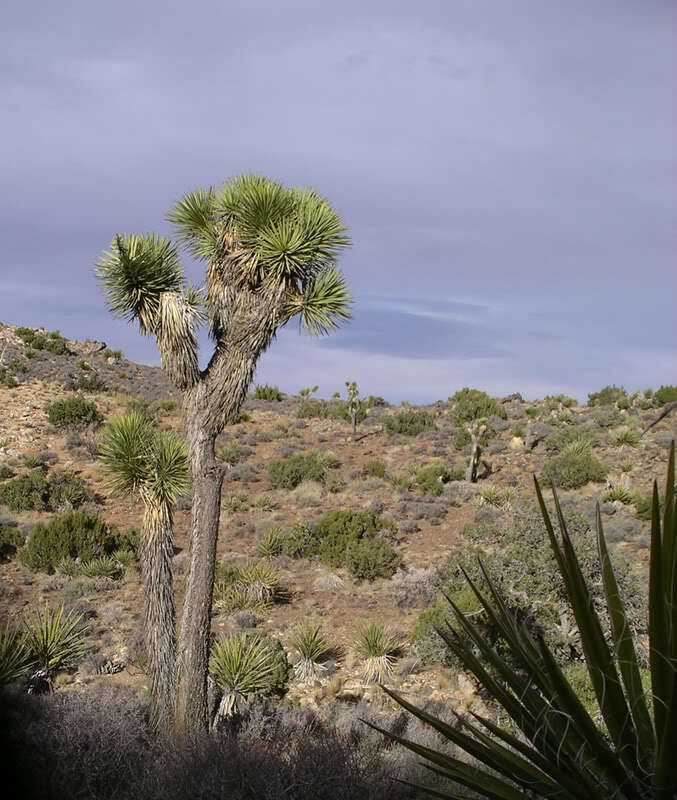 What is the most common tree of the Desert Southwest? It is the Mesquite! Like many members of the Legume Family, mesquite trees restore nitrogen to the soil. There are 3 common species of NATIVE mesquite trees: Screwbean Mesquite (Prosopis pubescens ), Honey Mesquite (Prosopis glandulosa), and Velvet Mesquite (Prosopis velutina). These native trees are extremely drought tolerant. Honey Mesquites are more rounded with big, floppy, drooping branches. The foliage is feathery and straight – paired with sharp spines on twigs. This tree normally reaches 20–30 ft, but can reach as tall as 50 ft (15 m). The growth rate is medium. Honey mesquite coppices (it will make new growth from a root or stump if it is cut down), making permanent removal extremely hard. 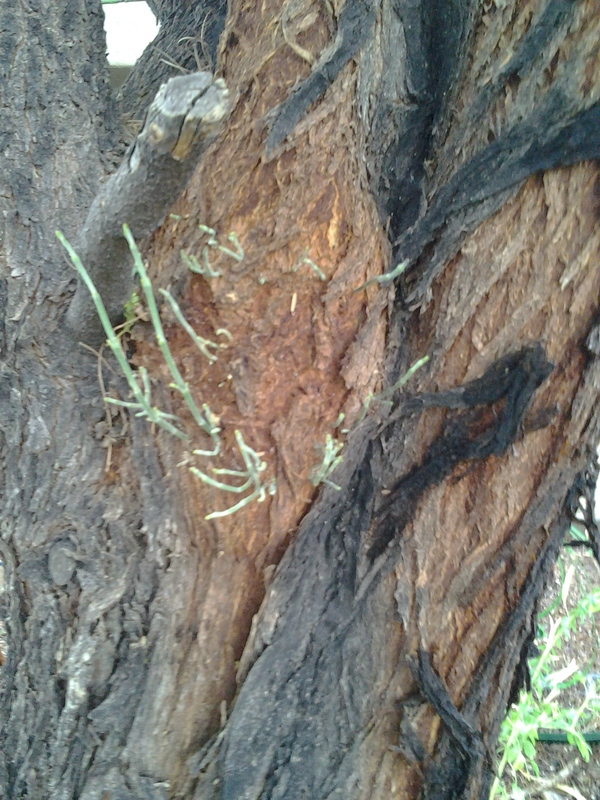 If a single trunk is cut down the Honey Mesquite will replace it with a multiple trunk version. 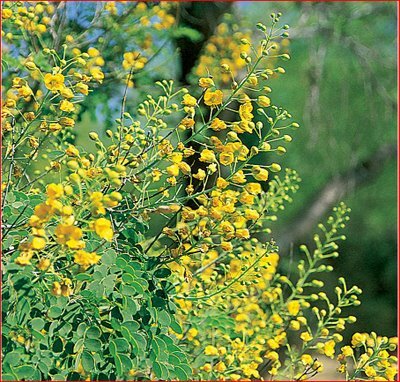 The Honey Mesquite has pale, yellow, elongated spikes and bears straight, yellow seed bean pods. 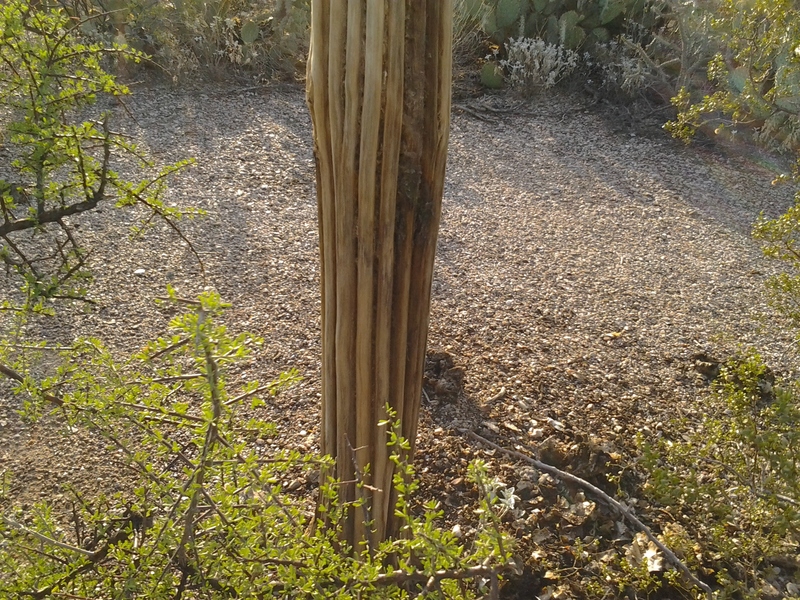 In this picture you can see how long and strong this mesquite’s spikes are. I’ve learned NOT to wear flip-flops when walking around our Honey Mesquite! 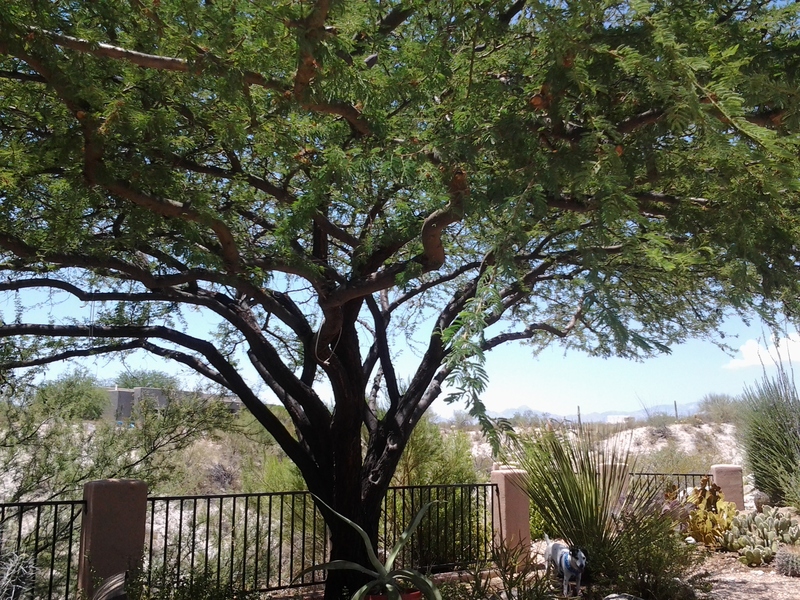 Caring for mesquite trees is a simple process after the tree has fully matured. Mesquite trees need a full day’s worth of direct sun light to grow. Make sure to plant your mesquite tree in a place where it will always have a lot of quality sun. 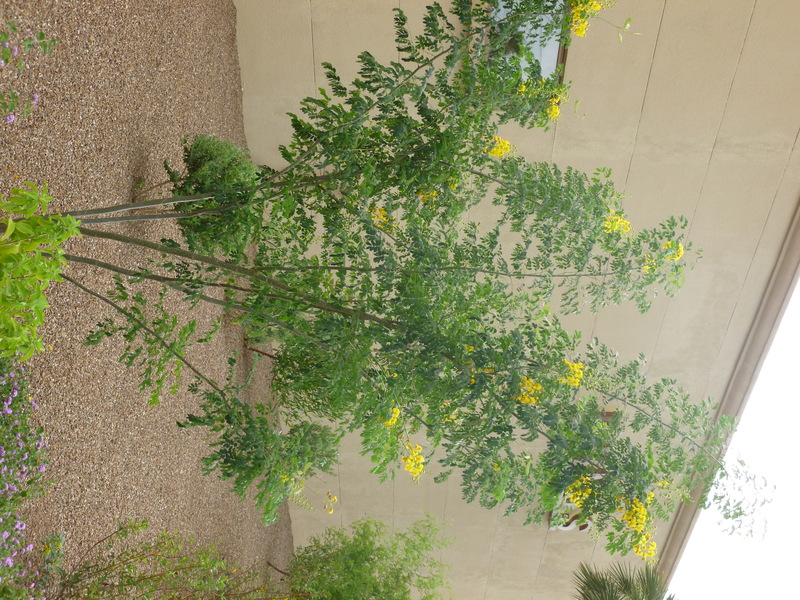 Good staking is crucial to the mesquite tree, especially in areas with severe summer storms, monsoon season, or high winds. 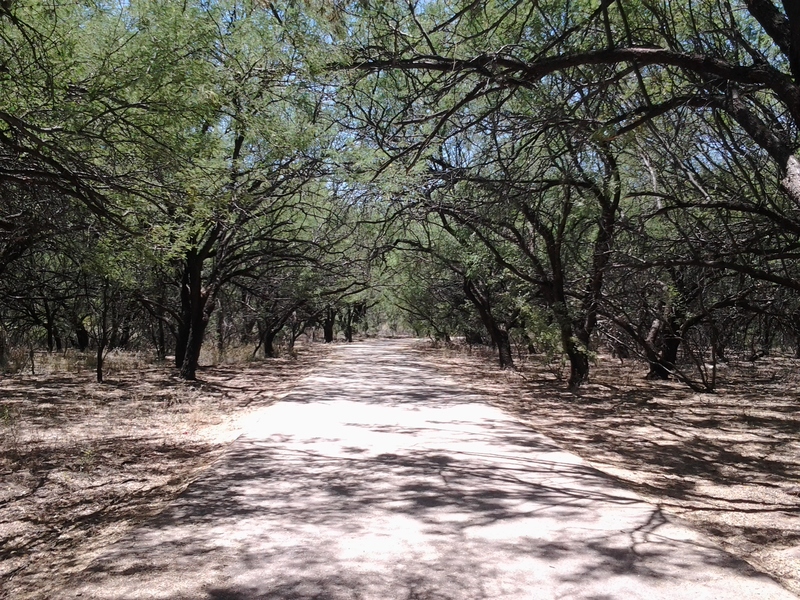 The shade from these native Arizona trees create a 10-15 degree cooler temperature! 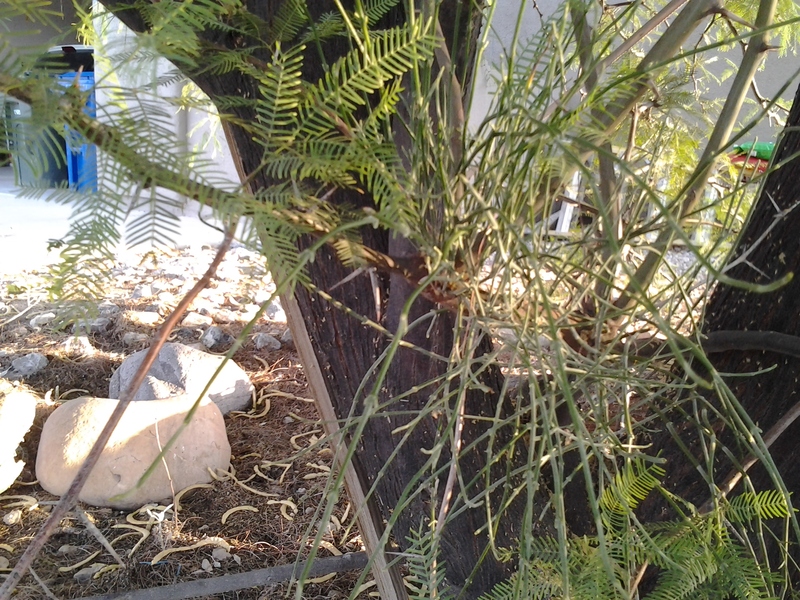 The shortcoming of a Chilean or Honey Mesquite tree is wind damage. 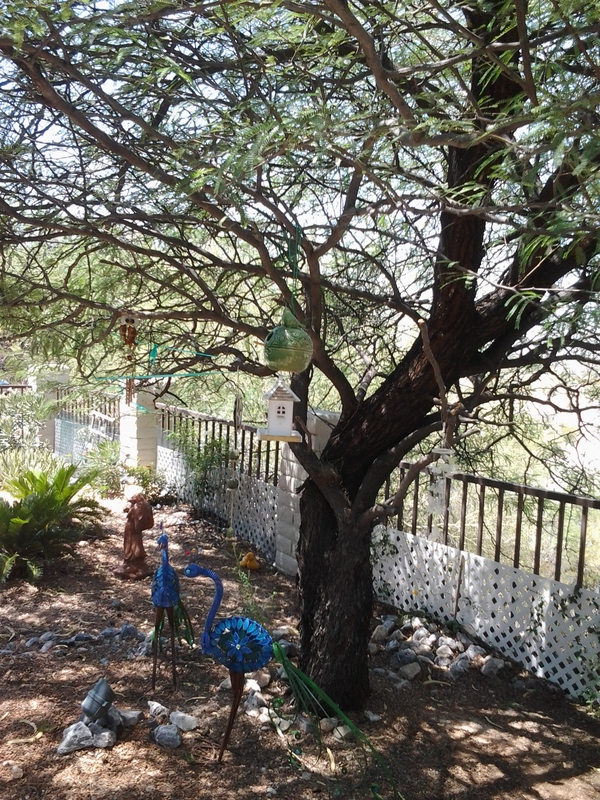 Proper staking and proper watering can help you avoid wind damage with your mesquite trees. Make your Mesquite trees “seek out” water and nutrients by careful arrangement of your irrigation emitters and scheduled DEEP irrigation. 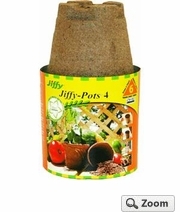 This will develop a more dispersed root system and reduces the risk of wind throw. Pruning will keep your tree from becoming messy, while stimulating new growth on those branches that you pruned. The dead, diseased, broken or weak branches, drain the Mesquite tree’s energy. Mesquite bean pods are rich in carbohydrates and have very low moisture content, making them an excellent source for harvesting, processing, and storage. A variety of animals eat the seeds such as quail, dear, javelina, coyotes, squirrels and rats. 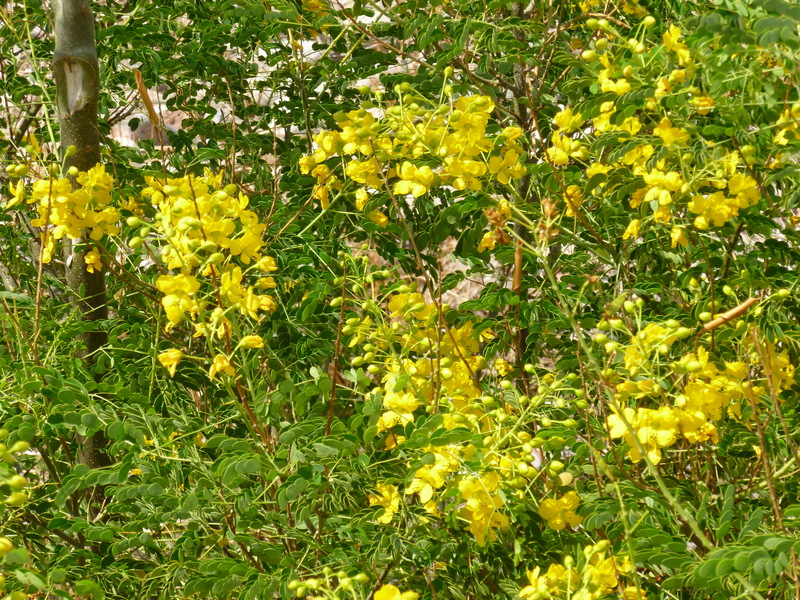 Historic records have indicated that almost every part of the mesquite tree has a use. The Pima Indians of southern Arizona referred to the mesquite as the TREE OF LIFE. During the inevitable droughts and deprivations of desert frontier days, the mesquite trees served up the primary food source for caravans and settlers. Mesquite beans became manna from heaven. Medical studies of mesquite trees and other desert foods, said that despite its sweetness, mesquite flour (made by grinding whole pods) is extremely effective in controlling blood sugar levels in people with diabetes. Mesquite trees have lateral roots that extend far beyond the canopies of the plants and tap-roots that penetrate well below the surface of the soil. Some mesquites may live for more than two centuries; according to U. S. Department of Agriculture, Forest Service. (Prosopis Velutina) Velvet Mesquite is the most common of the North American varieties, it ranges from southern Arizona, southwestern New Mexico, and most common to the Chihuahua and Sonoran deserts of Mexico. Velvet Mesquite Trees are a deciduous plant that benefits by being able to retain moisture during the winter or exceptionally dry seasons better because water does not escape through the leaves. 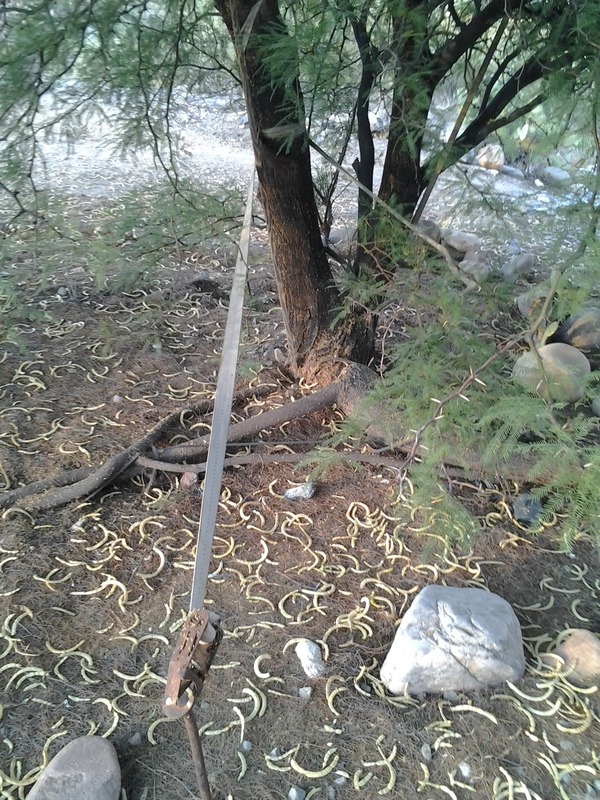 These Mesquite trees have elongated bean pods that are sweet to taste when ripe ( reddish-yellow color). 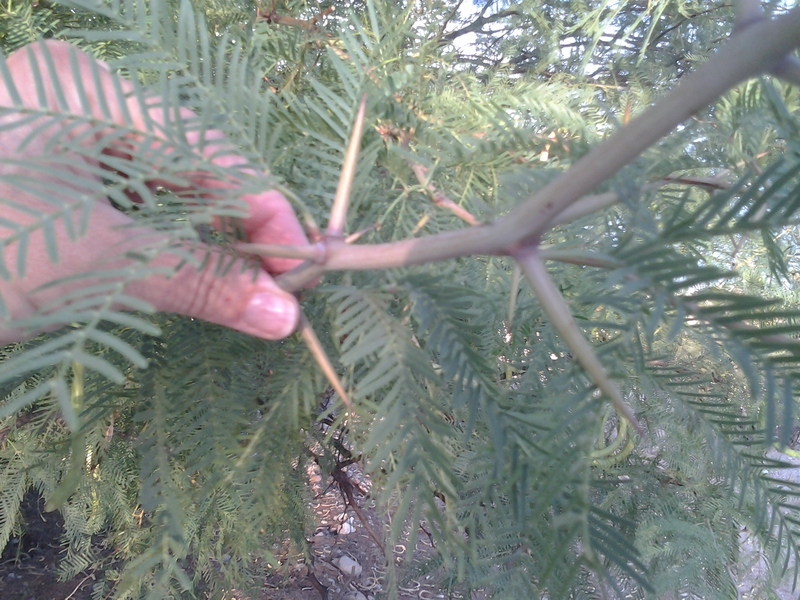 This native tree has thorns with varying lengths even on the same branch. For the first year, deeply water your mesquite tree every week or so until it has properly matured. Once your velvet mesquite tree has matured, it can survive with a little supplemental water in addition to natural rain. In case of droughts, do water your mesquite trees more often. Velvet Mesquites hold the record for deepest root (160′); these tap-roots can tap into deep, underground water supplies that aren’t available to the average plant. 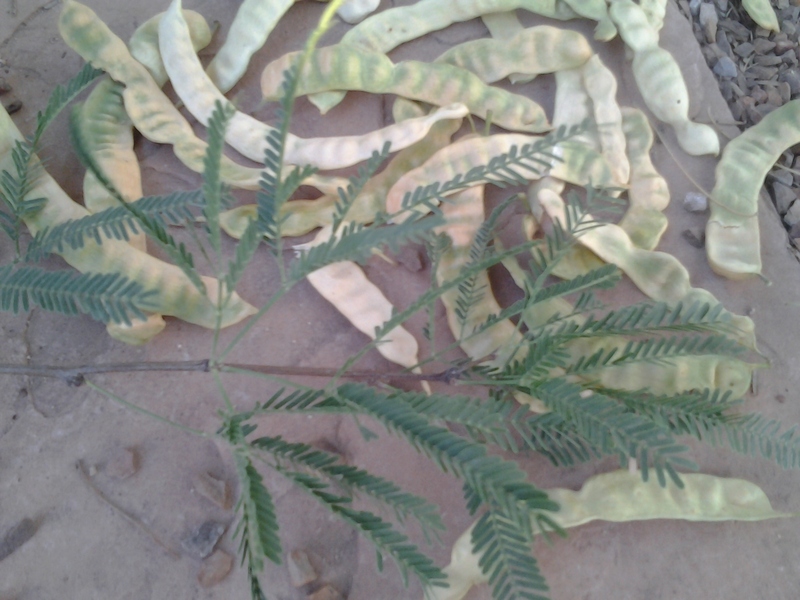 The seeds of mesquite trees need to be scarified (abraded in flash flood or digestive tract) to germinate. Coyotes, and other desert animals eat the bean pods regularly. The difference between drought tolerant and drought resistant plants? Define drought tolerant. What is a drought resistant plant? Here is the difference between drought tolerant (true desert plant) and drought resistant (originated in semi-arid places). A flower or plant that has naturally evolved to survive periods of drought with little water and has the ability to tolerate substantial dehydration of their tissues and organs is drought tolerant. 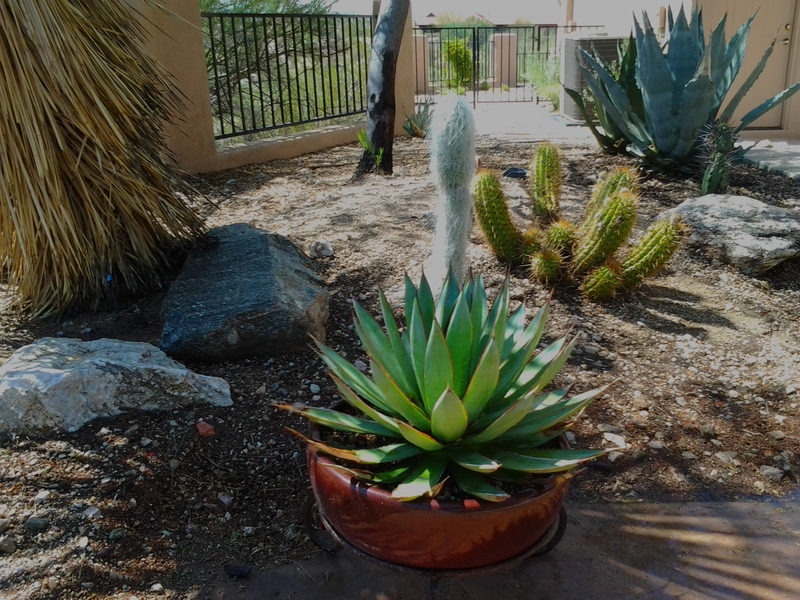 Xerophytes are the BEST drought tolerant plants, shrubs, trees, and cacti. 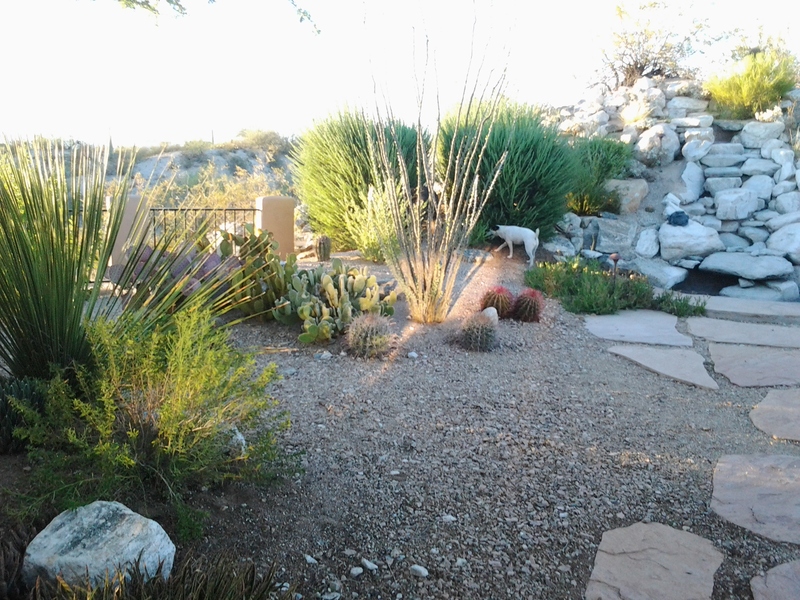 Cacti and many plants survive on little water and make Xeriscape not only essential but pleasing to the eye. Derived from the Greek word “xeros”, meaning “dry” and combined with landscape, xeriscape means gardening with less than average water. Many xerophyte plants have specialized tissues for storing water, as in the stems of cacti and the leaves of succulents. Others have thin, narrow leaves, or even spines, for minimizing water loss. Xerophyte leaves often have abundant stomata to maximize gas exchange during periods in which water is available, and the stomata are recessed in depressions, which are covered with fine hairs to help trap moisture in the air. Drought tolerant plants have adapted by making use of either C4 Carbon Fixation or CAM (crassulacean acid metabolism) a carbon fixation pathway that evolved in some plants as an adaptation to arid conditions. In a plant using full CAM, the stomata, in the leaves, remain shut during the day to reduce the loss of water as vapor, but open at night to collect carbon dioxide (CO2). The CO2 is stored and then used during photosynthesis, which is the process of capturing the suns energy. 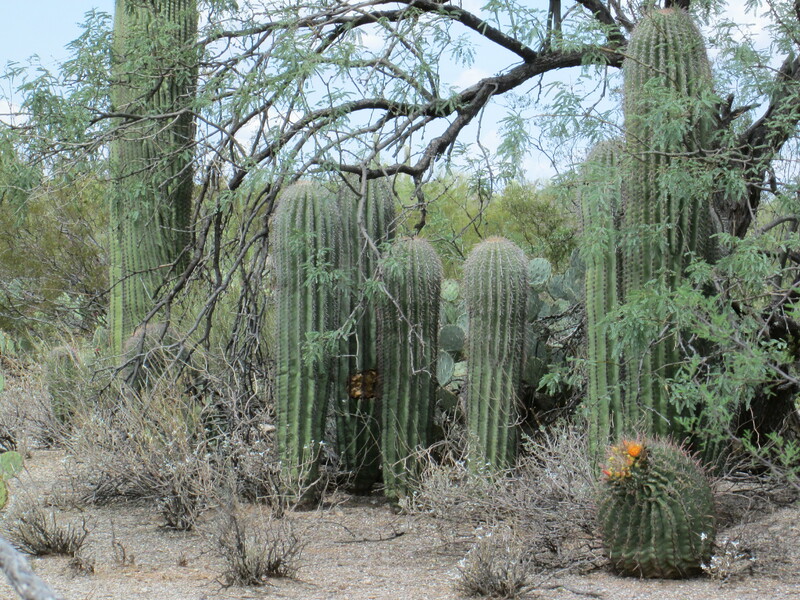 Saguaro cactus and Palo Verde Tree are well – adapted drought tolerant plants. CAM is particularly good for arid conditions because CO2 can be absorbed at night, allowing the pores on the leaves to stay closed during the day and thus reducing water loss. 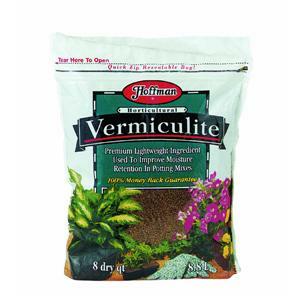 A easy way to explain it is drought tolerant plants can slow down metabolism. High elasticity of the cytoplasm and the capacity to withstand compression of the cells during dehydration are characteristic of drought-tolerant plants. What is cytoplasm? An easy definition of cytoplasm is a gel-like casing, covering – containing all the contents of the cell’s organisms, except the nucleus. Most metabolic (chemical reactions) pathways occur in the cytoplasm. 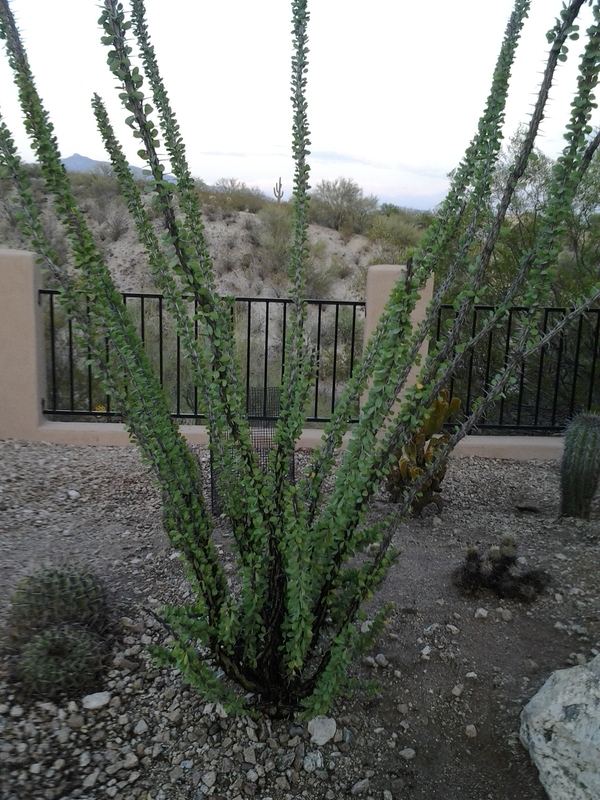 Not to be confused with drought-tolerant plants, Drought Resistant plants are not true desert plants. Many have originated in semi-arid regions, the area around the Mediterranean, Latin America and sub-Sahara. Here are pictures of drought resistant plants that are not native desert plants. 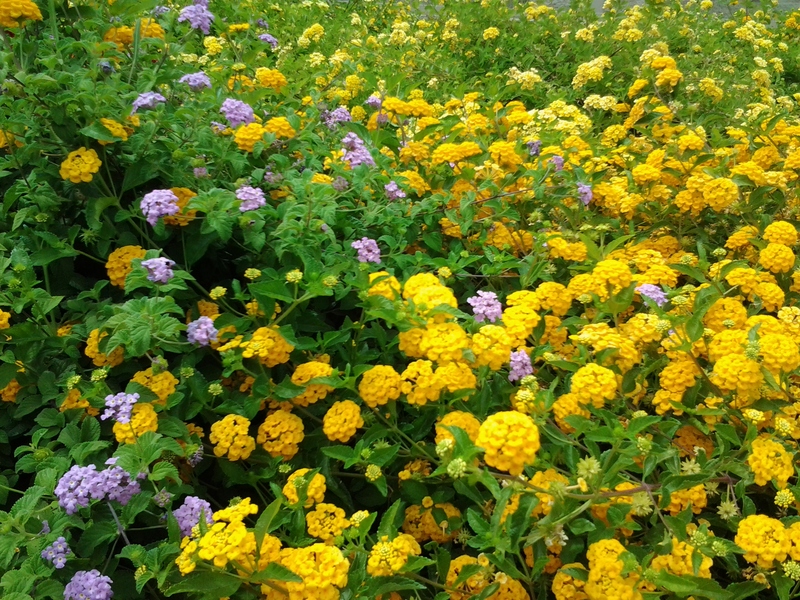 Lantana, in the verbena family, is a highly attractive drought resistant flowering plant that originated in tropical regions of Africa and the Americas. This plant has it all: Drought resistant, it looks great, it smells wonderful, and it’s as tough as nails (as long as it’s not too wet). 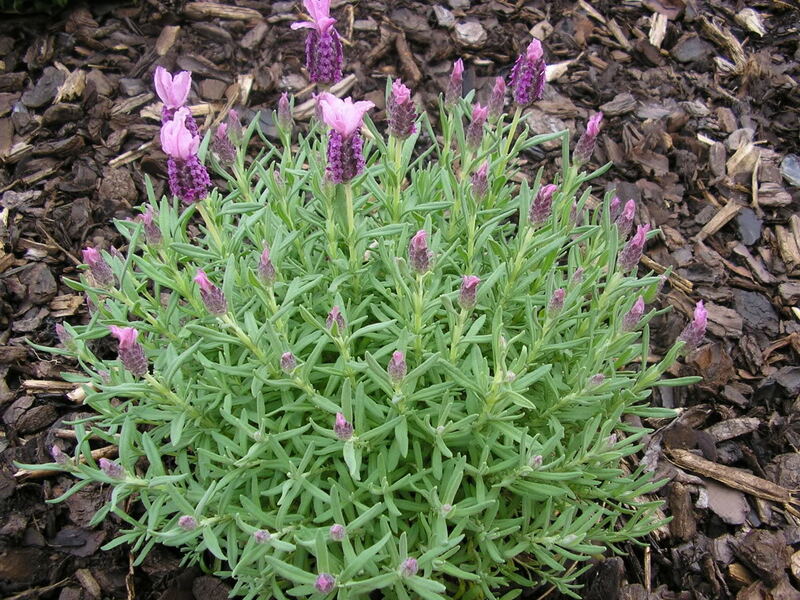 Lavender is in the mint family and originated in the Old World around the Canary Islands, Africa, India, and Asia. 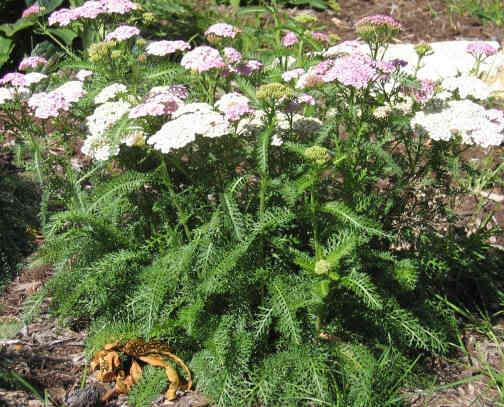 Not only does yarrow tolerate heat and drought like a champion, but this easy-growing perennial is also a great cut flower. 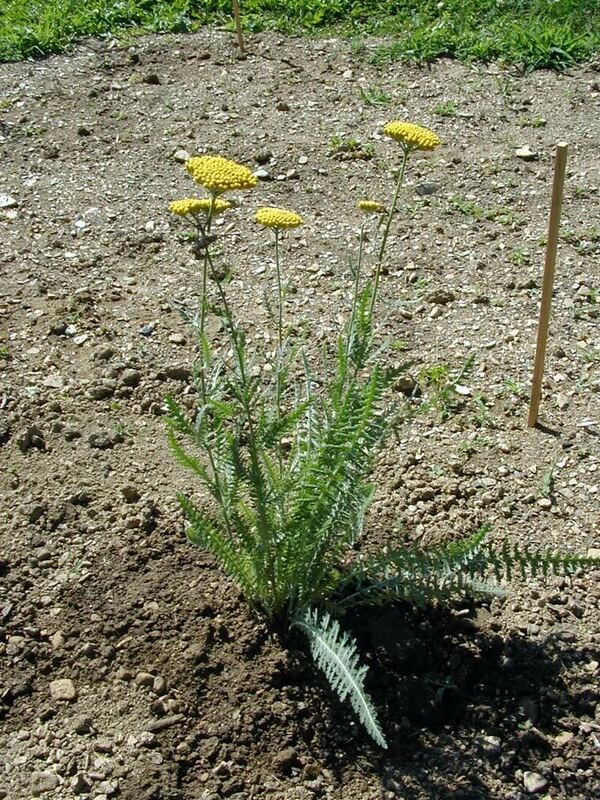 Yarrow, Achillea millefolium, originated in regions of Asia and Europe. There is a difference between drought resistant and drought tolerant plants. Knowing the difference can save you considerable heartache. 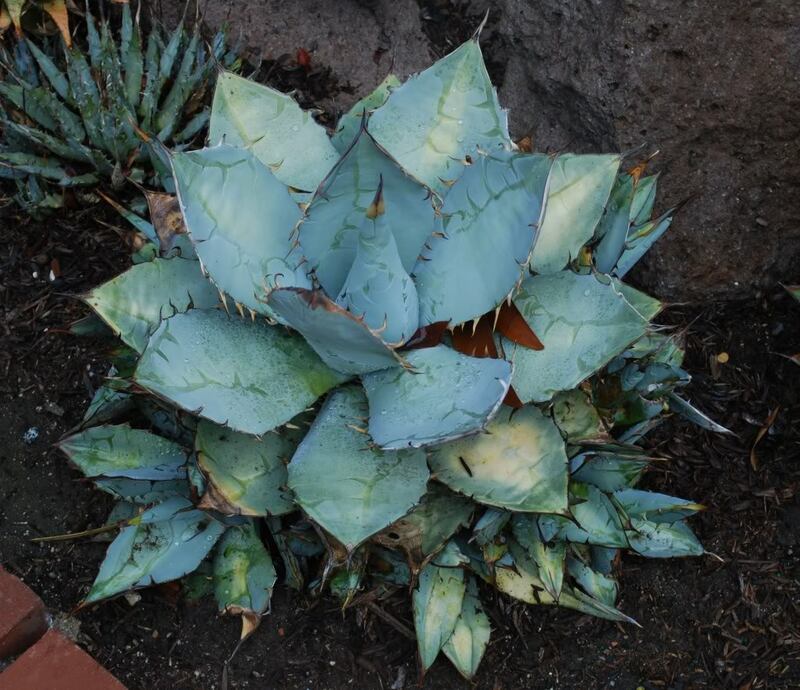 Author tjsgardenPosted on September 10, 2015 May 14, 2016 Format GalleryCategories Agave, Cactus, Succulents, Desert Plants, Desertscape, Drought Resistant, Drought Tolerant, Flowering Cactus, Flowers, Free Pictures, Hardy Plants, Heat Resistant Plants, Lantana, Lantana, Perennials, Saguaro, Saguaro National Park, Sonoran Desert, Trees, Unique Garden Items, Xeriscape, Xeriscape, Desertscape, Yellow Palo Verde Tree, YuccaTags Agave, cactus, Desert Flower, desert landscaping, difference between drought resistant and drought tolerant plants, Drought Resistant, Drought Tolerant Plant, Gold Lantana, Heat Resistant Plants, Lantana, Lavender, low maintenance plants, low water plant, Ocotillo, Perennials, Saguaro, Trailing Lantana, xeriscape, Yarrow4 Comments on The difference between drought tolerant and drought resistant plants? Does your tree look like it has a disease? It is common for Mistletoe to invade a host tree and become a parasite. 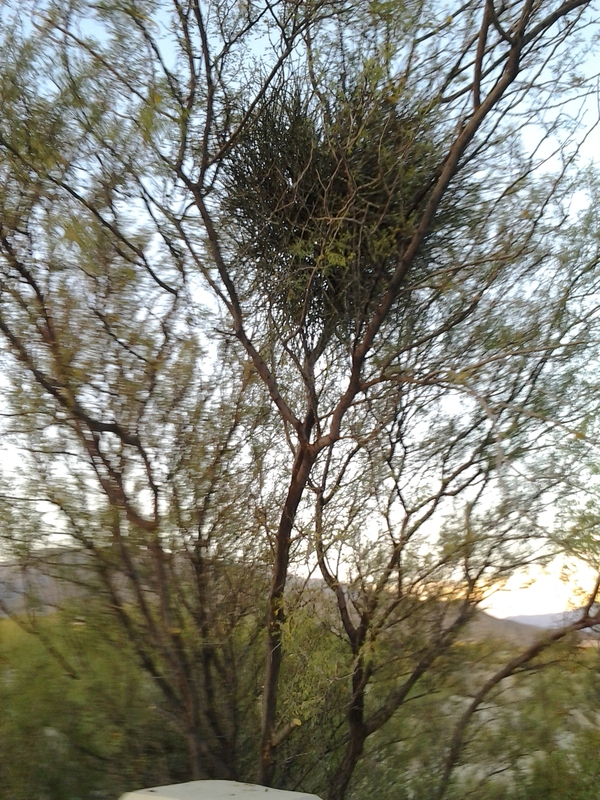 Desert mistletoe is a true evergreen plant and is an obligate (binding) parasite on its host. Mistletoe is one of the main causes of diseases in mesquite trees and is native to much of the eastern third of the U. S. Mistletoe plant berries are said to be poisonous, but birds do eat them. Desert Mistletoe or mesquite mistletoe, Phoradendron californicum, is a parasitic plant native to southern California, Nevada, Arizona, and Baja California. It can be found in the Mojave and Sonoran Deserts under 4000 feet elevation. 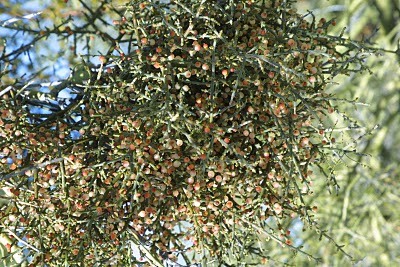 The female Mistletoe plant produces red seeds that the birds love to eat. The mistletoe seeds germinate and grow into the tree with sinkers (organs acting much like the roots of a plant). The mistletoe sinkers absorb water and nutrients from the tree host. These mistletoe roots grow inside the tree for some time eventually producing the conspicuous growth of stems, leaves and bulges. Mistletoe takes a long time to kill a tree but certainly causes decline. 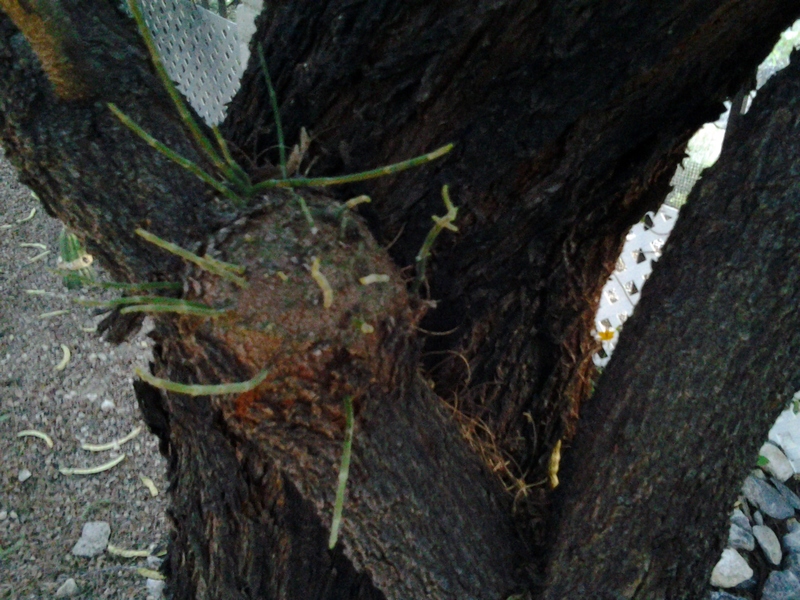 Mistletoe infections cause swelling and witches’ brooms (what is called the growth of stems seen in the photo below). Old severe infections may result in swollen areas of dead wood that are brittle and break easily. These limbs should be removed if they pose any danger. The only way to control mistletoe is to remove it manually. Put some gloves on and remove the mistletoe growth and stems with your hands. Manual removal does not kill the mistletoe because it is growing inside the trees tissue; but good control can be achieved by removing it. Pruning out heavily infected branches may help… but that decision is usually based on how much can be pruned without destroying the beauty of the tree. Also, it is impossible to know if you have pruned far enough away from the infection to get all the mistletoe that is growing inside the host. Wrapping pruned sites is not recommended since such procedures do not kill the mistletoe and may easily cause more harm than good to the tree. Sprays sold for mistletoe control will remove the outside growth just as pruning, but they do not kill the part of the mistletoe plant inside the tree. 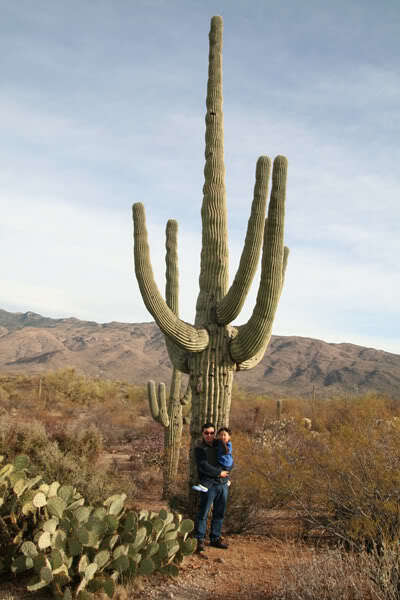 One of Arizona’s most majestic, lovable desert cactus plants is the Saguaro, Carnegiea gigantea. Being aware of the saguaro’s history and incredible internal design, it is an honor to walk close to the Giant Saguaro that is over 150 years old and standing tall. 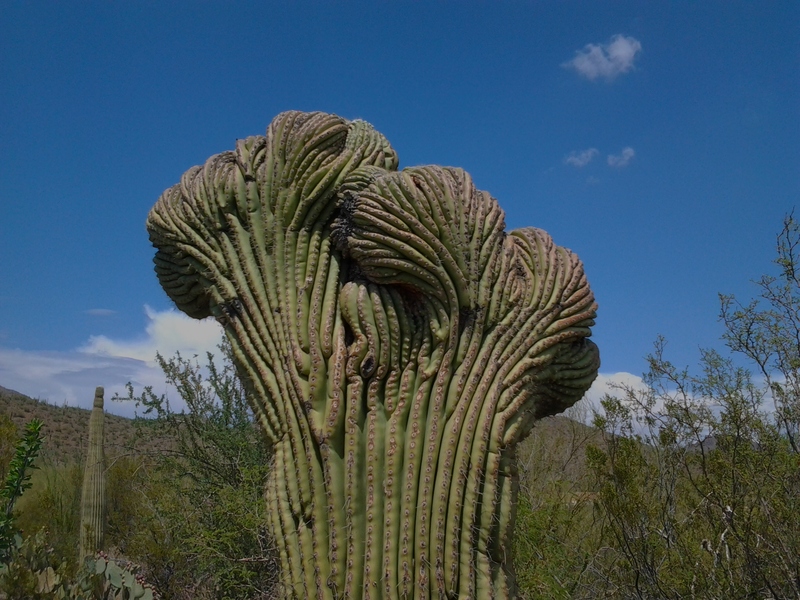 These desert cacti are large, tree-like columnar cacti that develop branches (or arms) as they age. 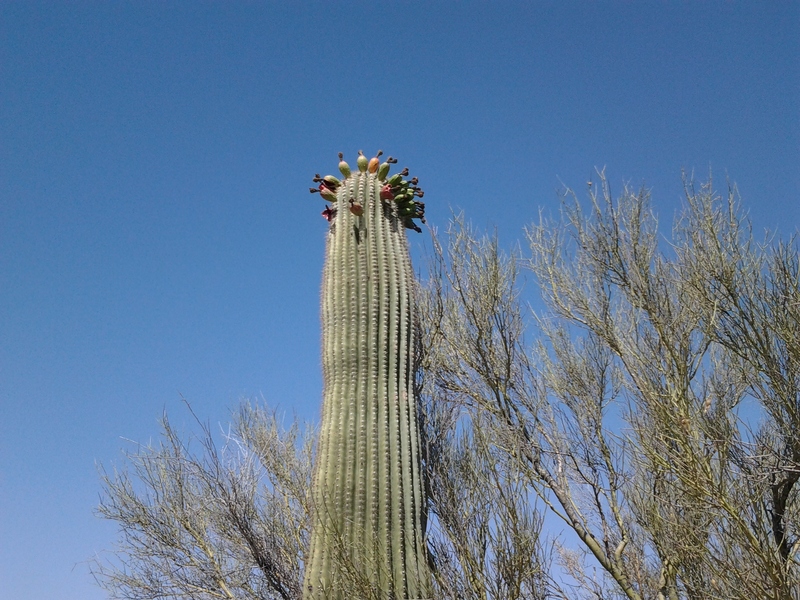 Saguaro Cactus can not tolerate freezing temperatures in the winter and this is what limits their range. 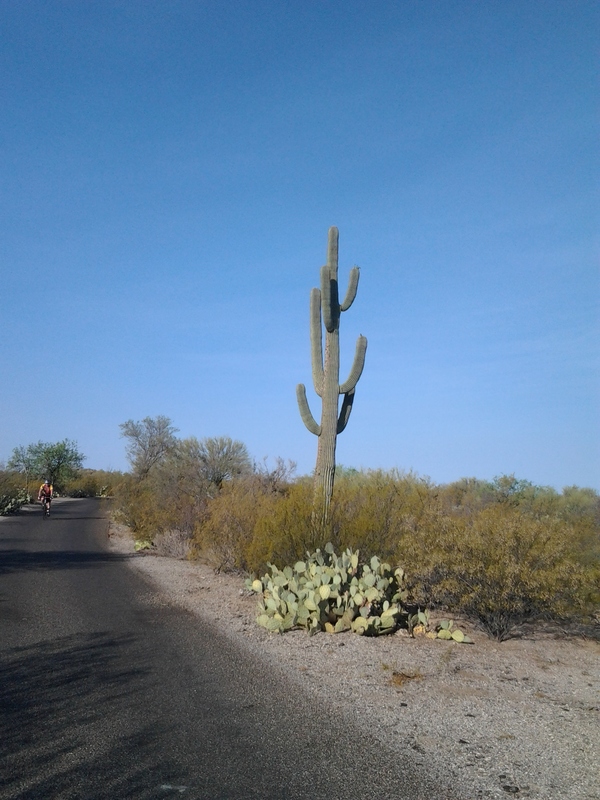 Saguaro FACTS: Saguaros are a very slow growing cactus. A 10 year old plant might only be 2 inches tall. 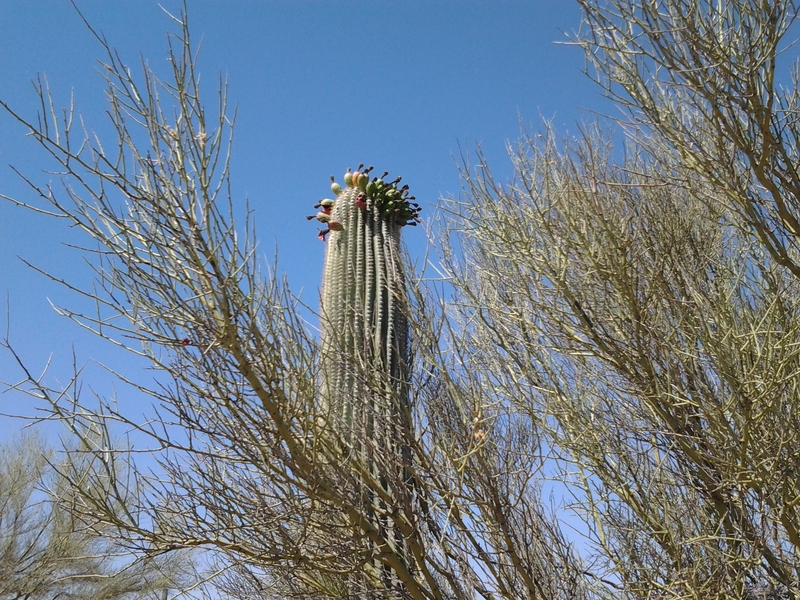 How tall can a Saguaro Cactus grow? It can grow 40 to 60 feet tall. 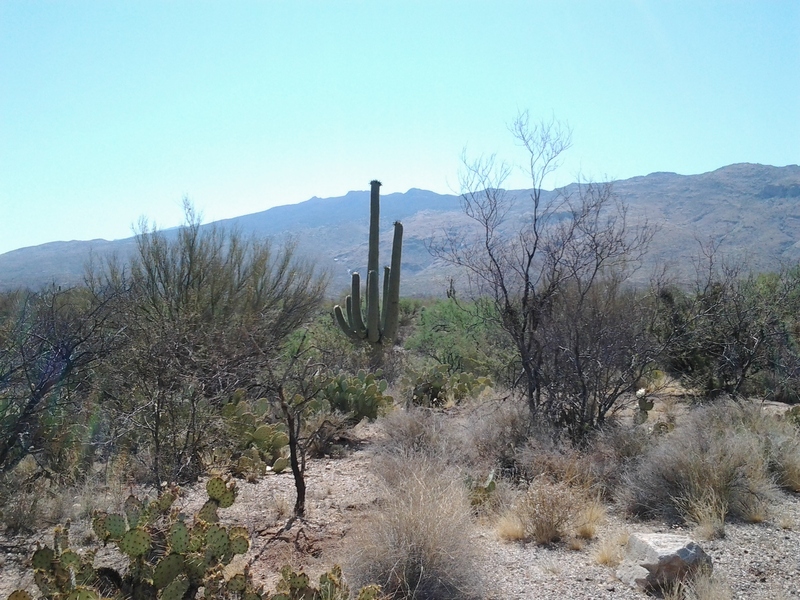 Below are Saguaro cacti at the bottom of Mica Mountain in Saguaro National Park. 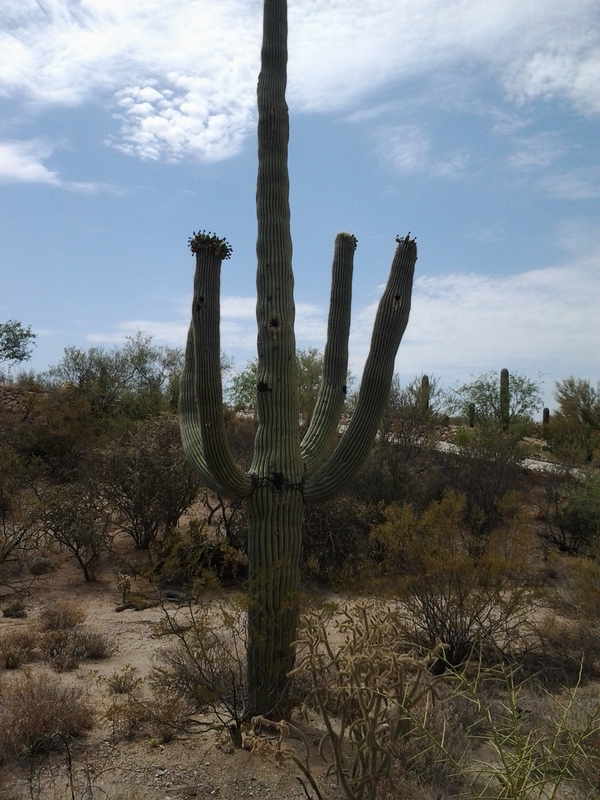 Saguaro cactus roots are only 4-6 inches deep and travel out as far from the plant as it is tall. There is one deep tap root that extends down into the ground. 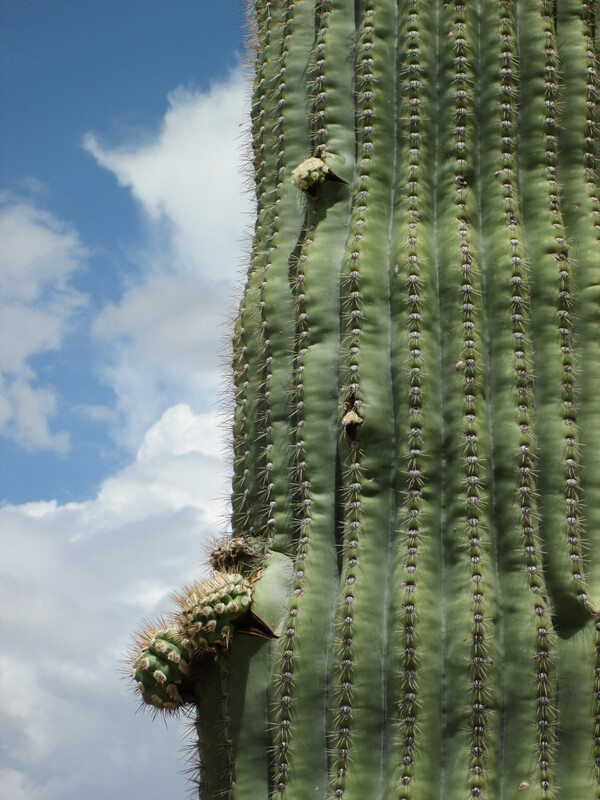 A Saguaro Cactus can gather enough water through its remarkable root system, during a significant rain, to last a year! 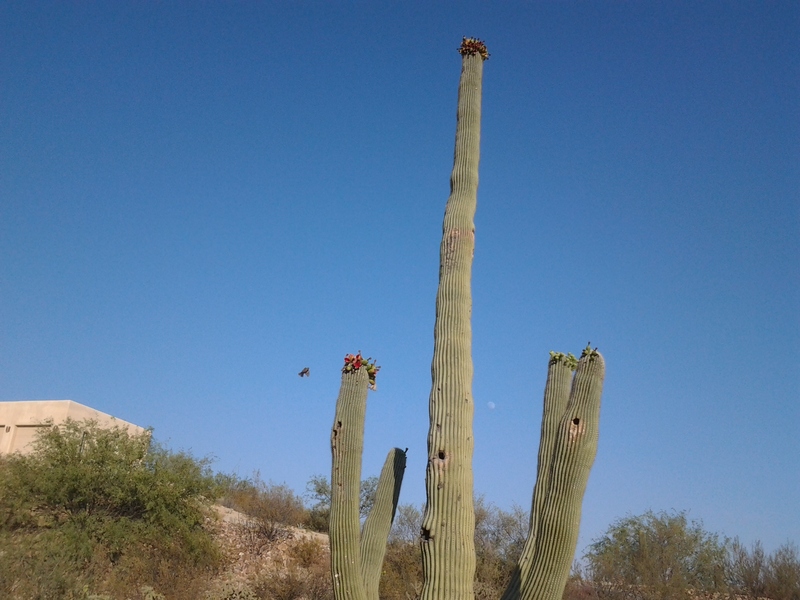 Why are there holes in the Saguaro Cactus? The gilded flicker and Gila woodpecker excavate nest cavities inside the saguaro’s pulpy flesh. Cactus Wrens are common birds that live in the holes (nests) of the Saguaro Cactus. 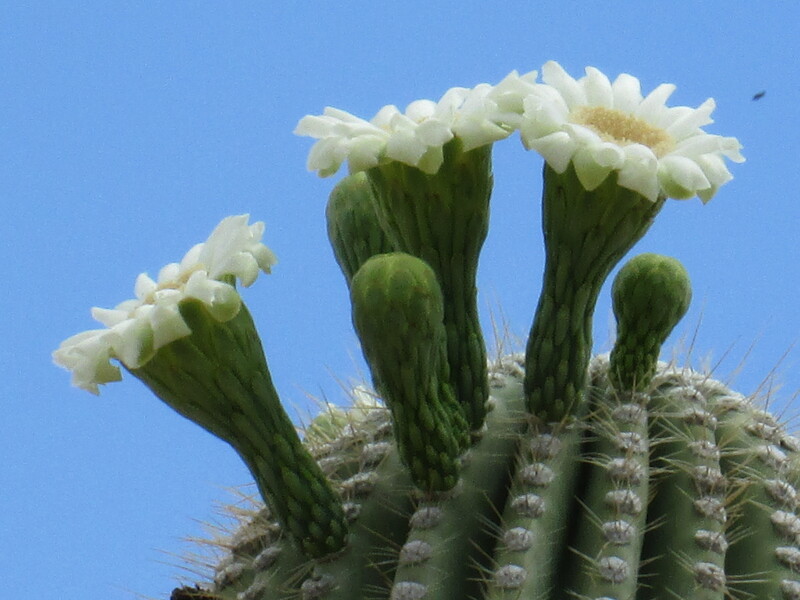 When a saguaro reaches 35 years of age it begins to produce flowers. 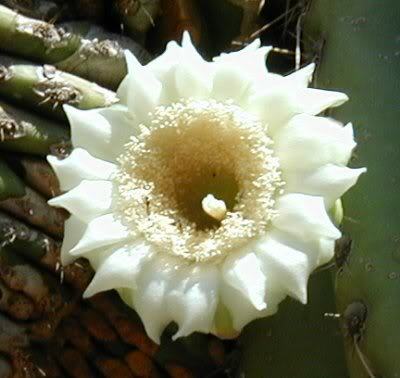 A Saguaro can only be fertilized from a different cactus – cross pollination. Only a few bloom each night awaiting to be pollinated and close by late morning. 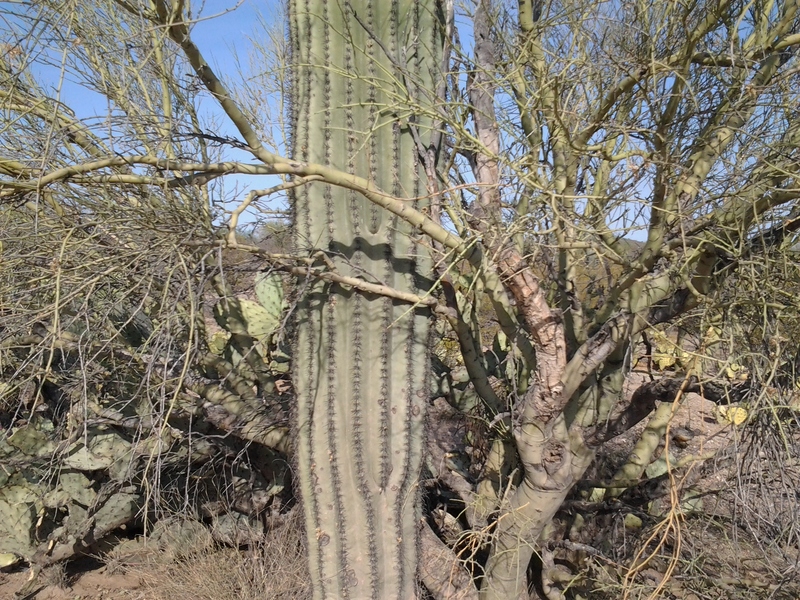 A living and dead Saguaro Cactus. 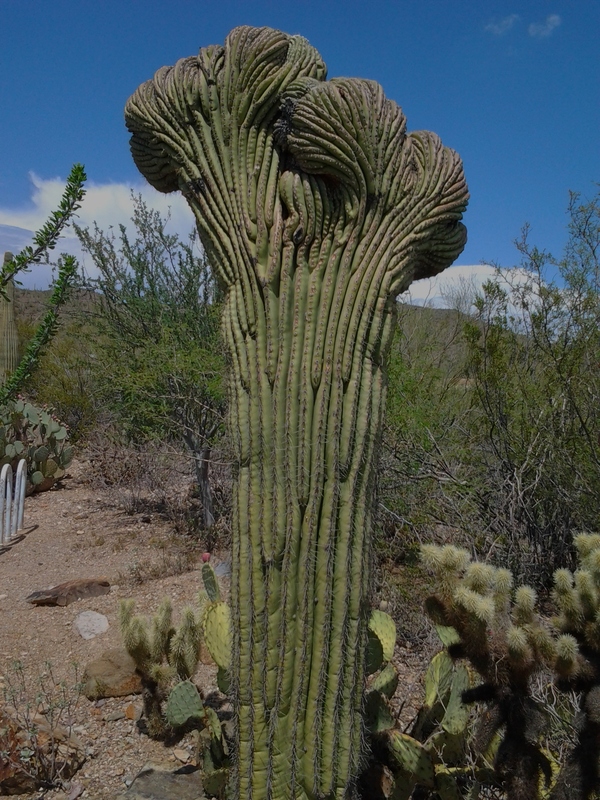 Because the major part of a desert saguaro cactus is made up of water, an adult plant may weigh 6 tons or more. This tremendous weight is supported by a circular skeleton of inter-connected, woody ribs. 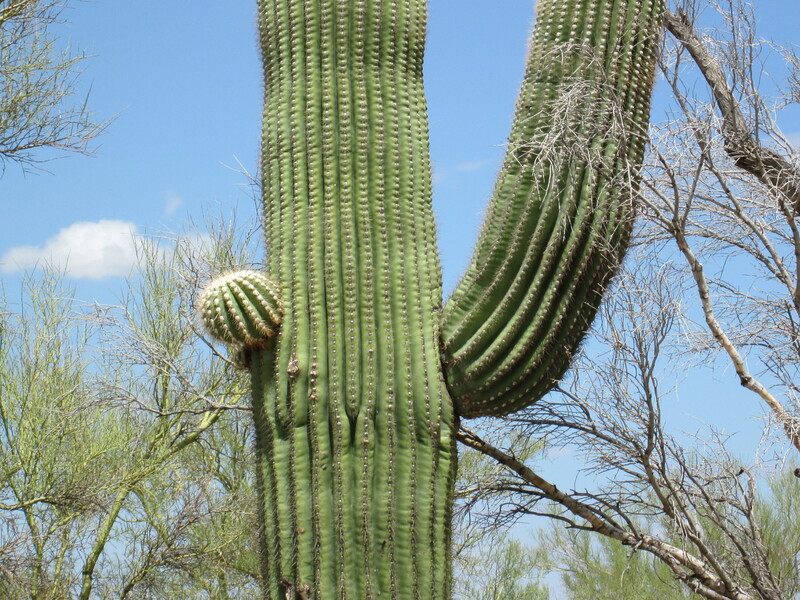 After the saguaro dies its wood ribs can be used to build roofs, fences, and parts of furniture. 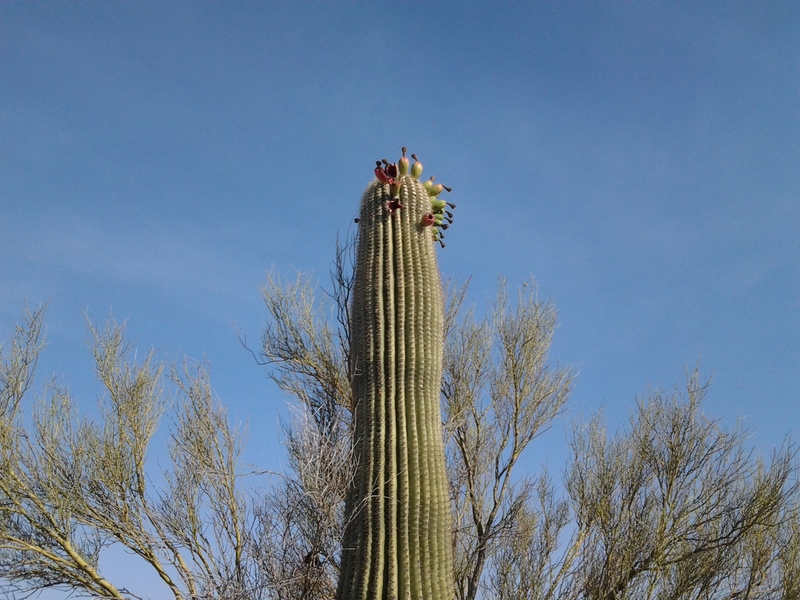 The holes that birds nested in are called saguaro boots. 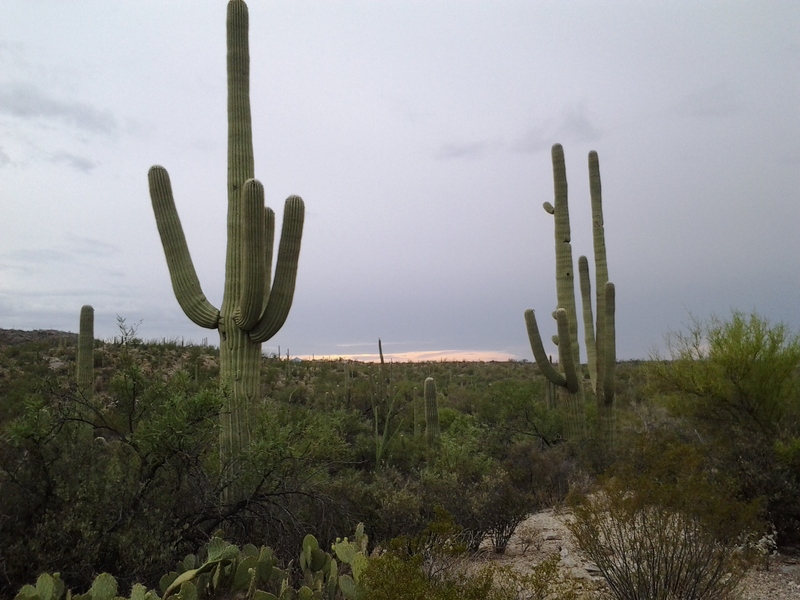 Native Americans used saguaro boots as water containers. 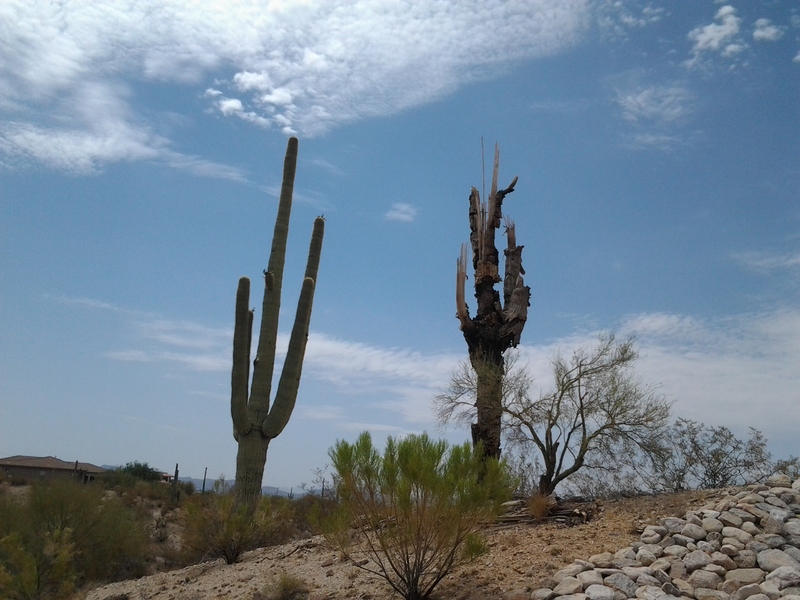 Saguaro branches normally begin to appear when the cactus reaches 50 to 70 years of age. 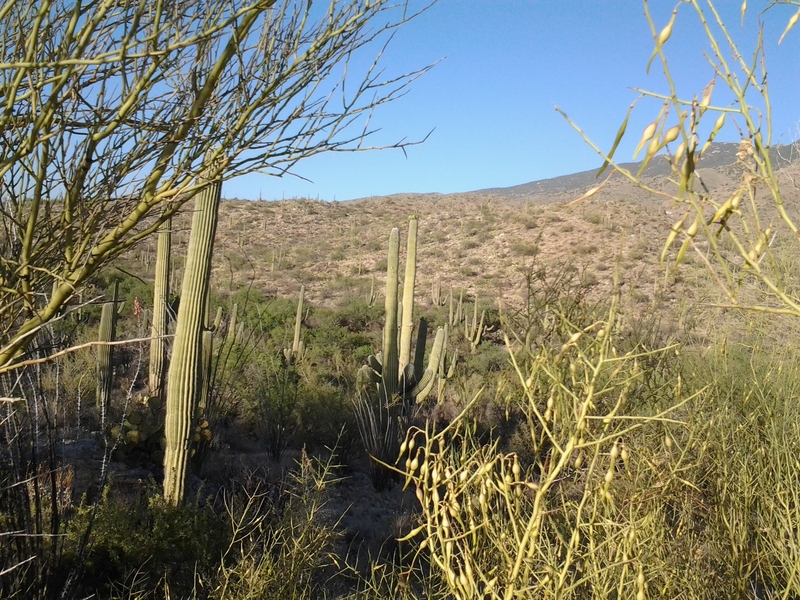 The average life span of a saguaro is approximately 175 years of age. 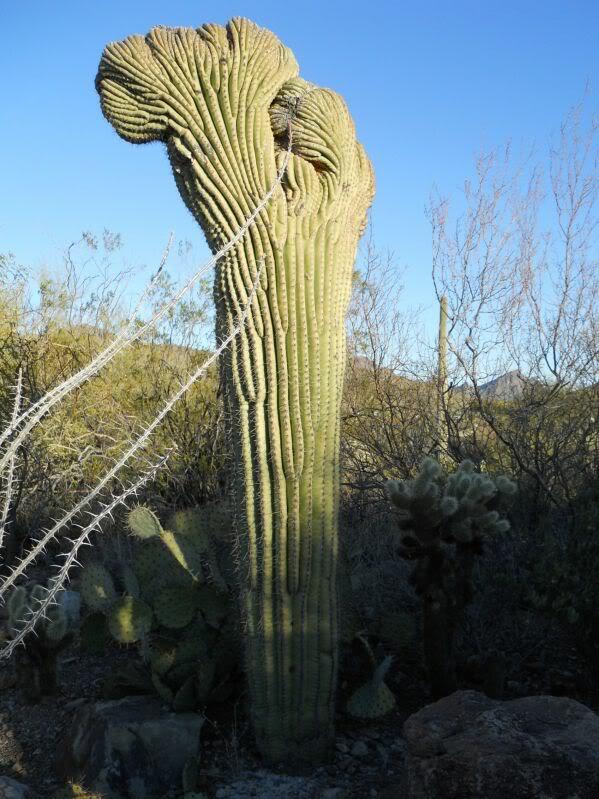 Experts have estimated that a Saguaro Cactus with more than 5 arms can be 200 years old. 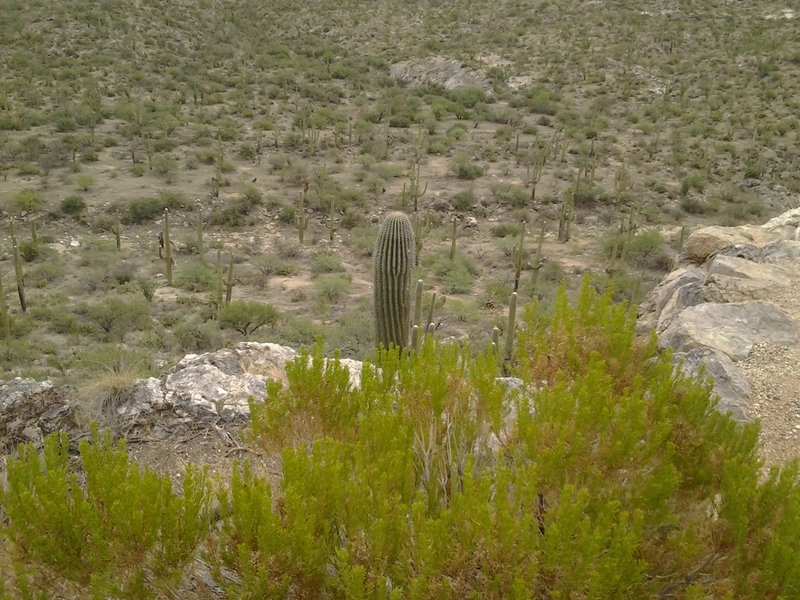 Young saguaro cacti can be very hard to find because they grow under the protection of a “nurse tree”. 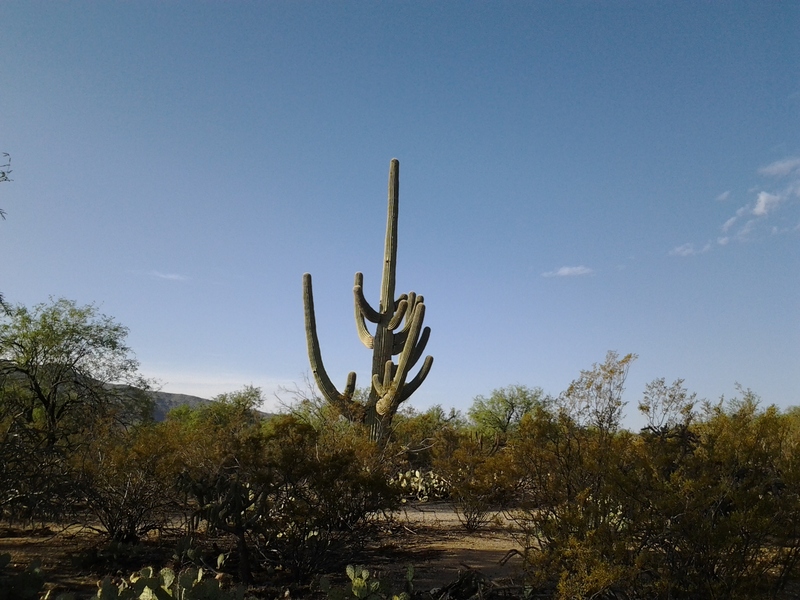 The nurse tree releases nitrogen in the soil which the Saguaros and other desert cacti use to grow healthy and strong. 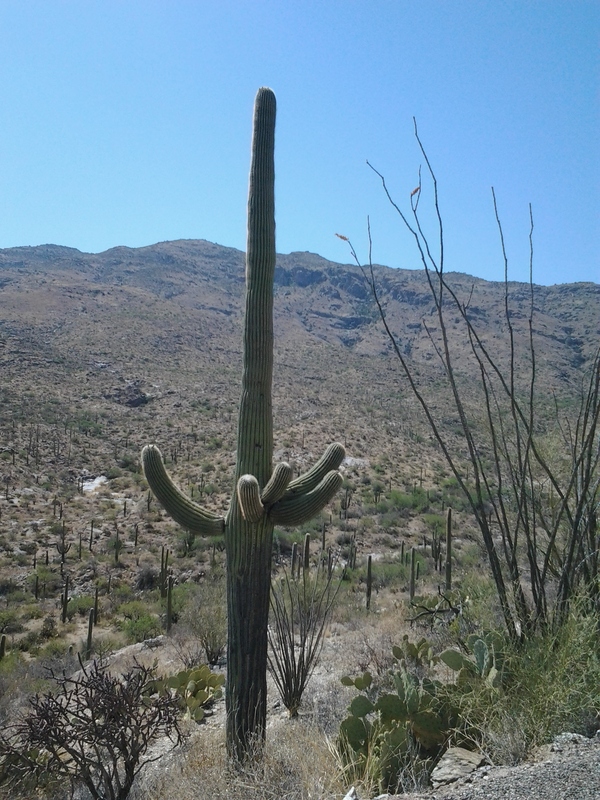 Saguaros sometimes grow in odd shapes or forms. 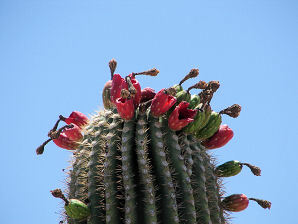 The growing tip of the cactus occasionally produces a fan-like form which is referred to as crested or cristate. 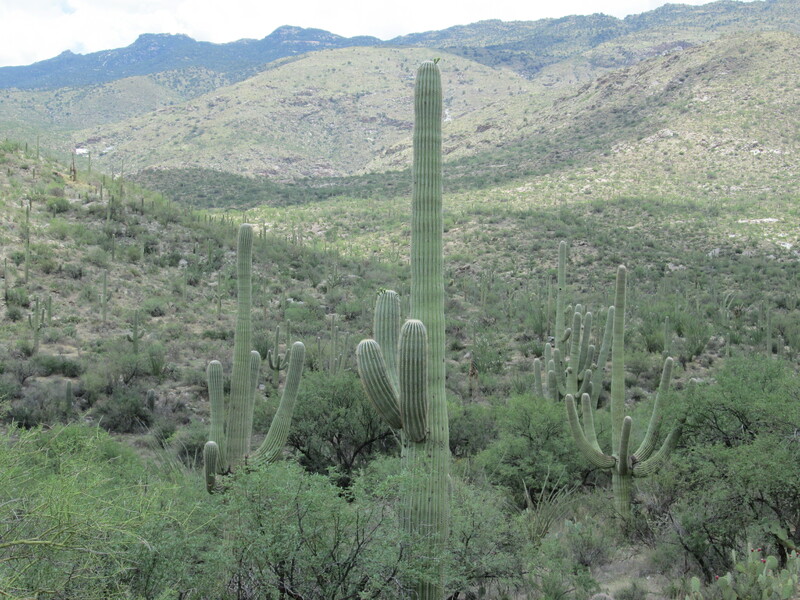 These crested saguaro cacti, Carnegia gigantea forma cristata, are rare. 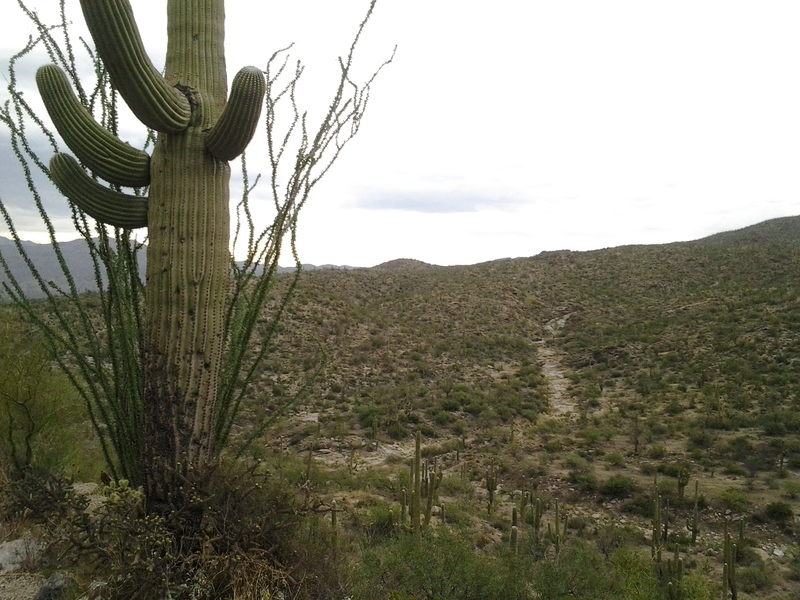 Biologists are not sure why these Saguaros grow this fan-like shape. 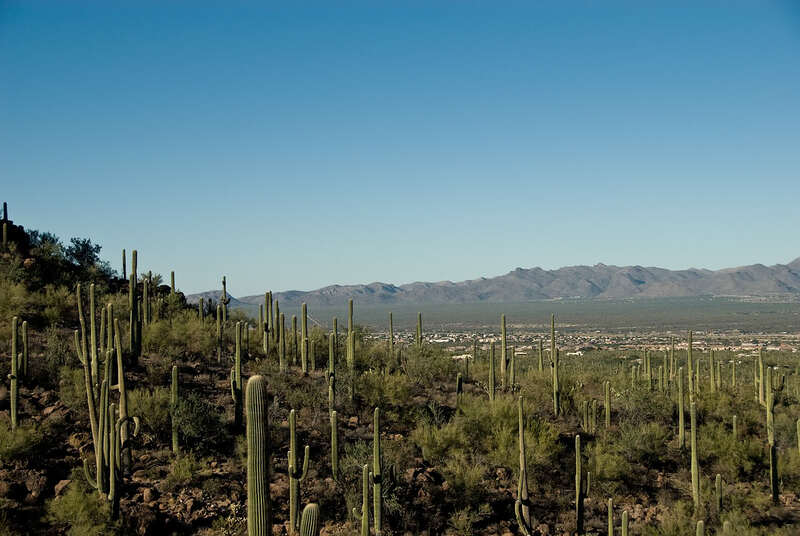 Arizona has strict regulations about the harvesting, collection or destruction of The Arizona Saguaro Cactus. 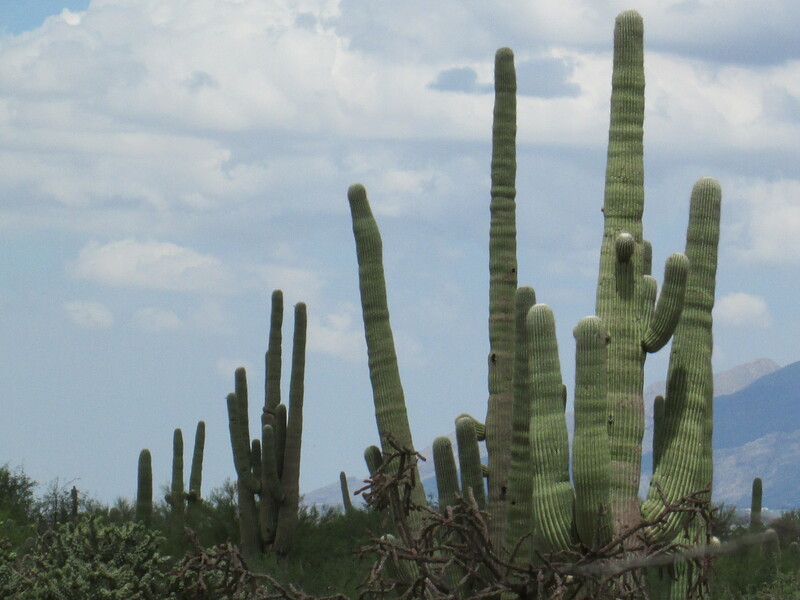 It is illegal to harm a Saguaro in Arizona. 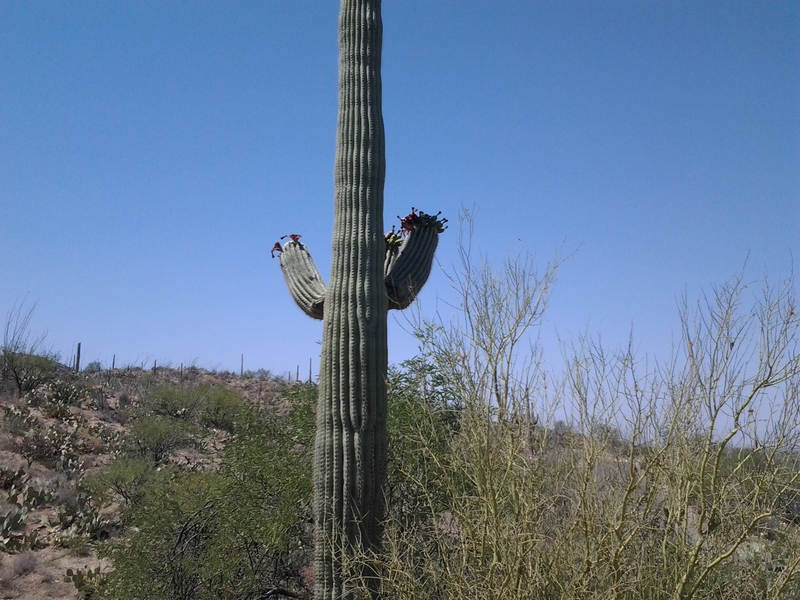 During building or construction, precautions must be taken to move every saguaro that may be affected. We make it a point to take visitors to Agua Caliente Park. This is an amazing lagoon; a get away from the prickly pear cacti and saguaros. It’s hard to tell that you’re even in Tucson. Agua Caliente presents you with an abundance of mature shade trees and lush backgrounds for picnics, weddings and even Plein-Air paintings. Roy P. Drachman Agua Caliente Park has a natural hot spring that flows through faults between gneissic rock and has been a long-inhabited settlement. What is gneissic rock? This type of rock has minerals arranged into layers which seem to be bands that alternate darker and lighter colors. The banding is developed under high temperature and pressure conditions. 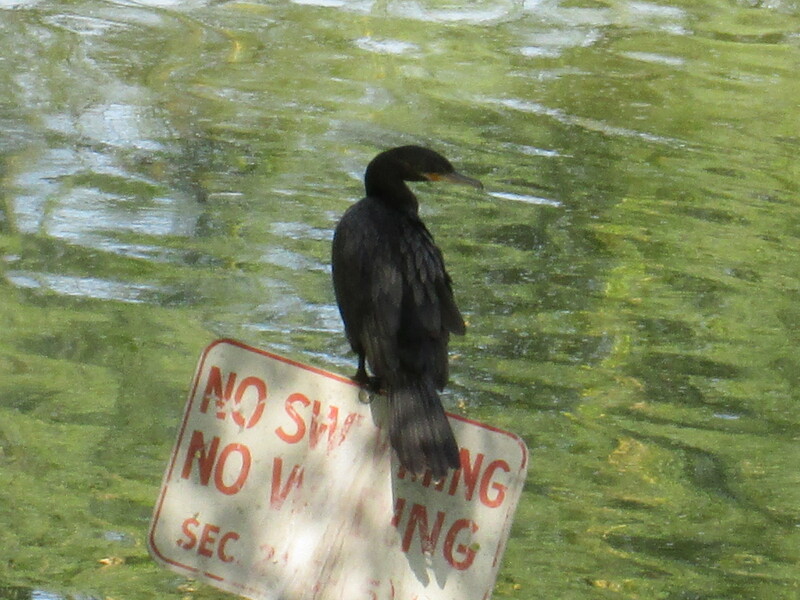 Ok now, is Agua Caliente a park, a lake, or a wildlife habitat? Well this natural spring is a bit of everything! Pack a picnic, hang out and be sure to bring a camera. 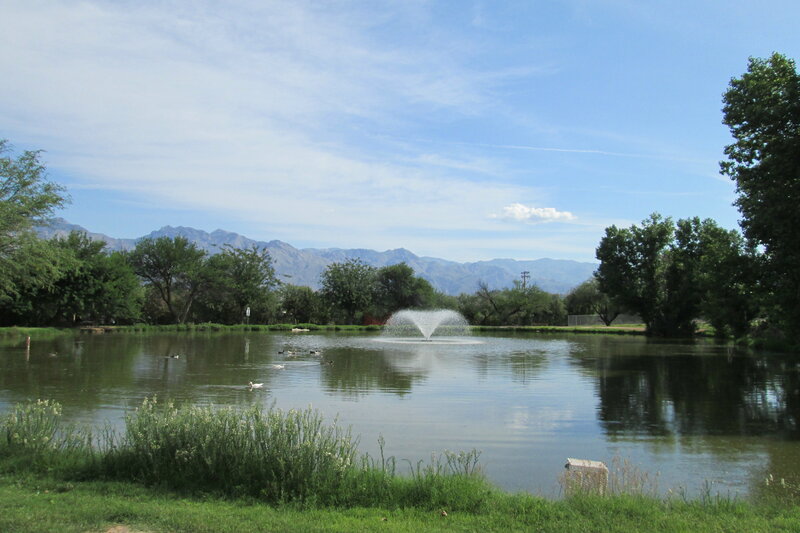 If you enjoy bird watching then Agua Caliente Park is worth a visit. The Tucson Audubon Society is housed in the original Ranch home. Take a look inside this historic building and enjoy the gift shop and gallery. The eccentricity of the mountains and mature palm trees are reflected with vibrant color in the water. 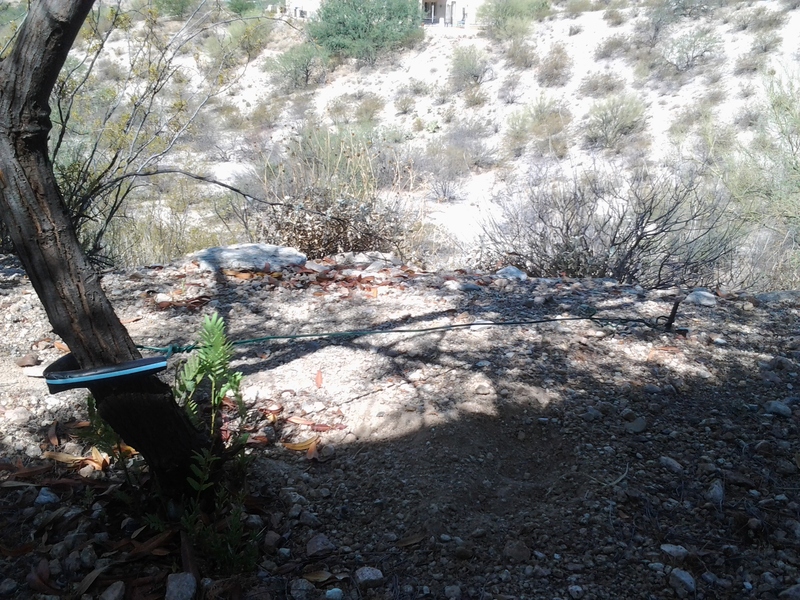 Here you can picnic at a 101 acre aquatic / riparian habitat surrounded by the Sonoran Desert. 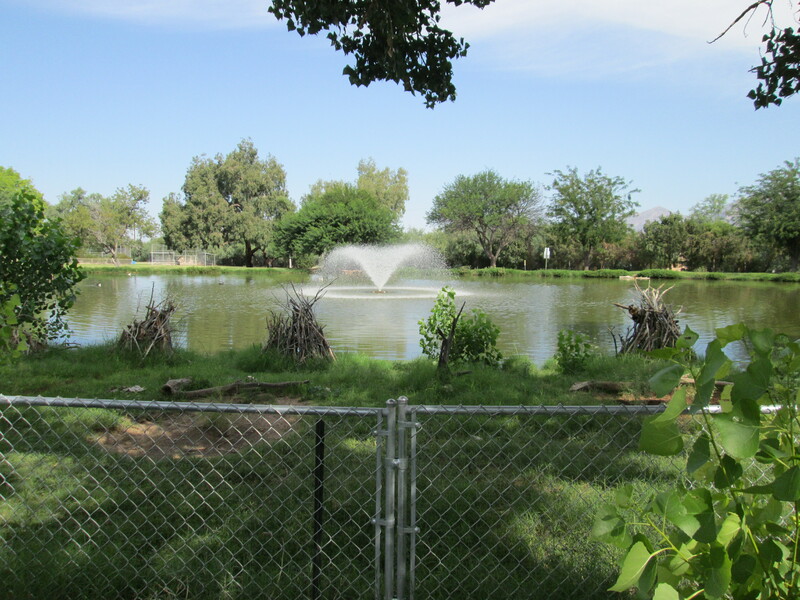 At Agua Caliente you will see a variety of wildlife including herons, Arizona turtles and a variety of ducks. The natural spring flow fluctuates at various times during the year due to drought. While visiting Agua Caliente you many see the lower ponds dry. Relax on a bench and watch dozens of turtles sunning themselves. 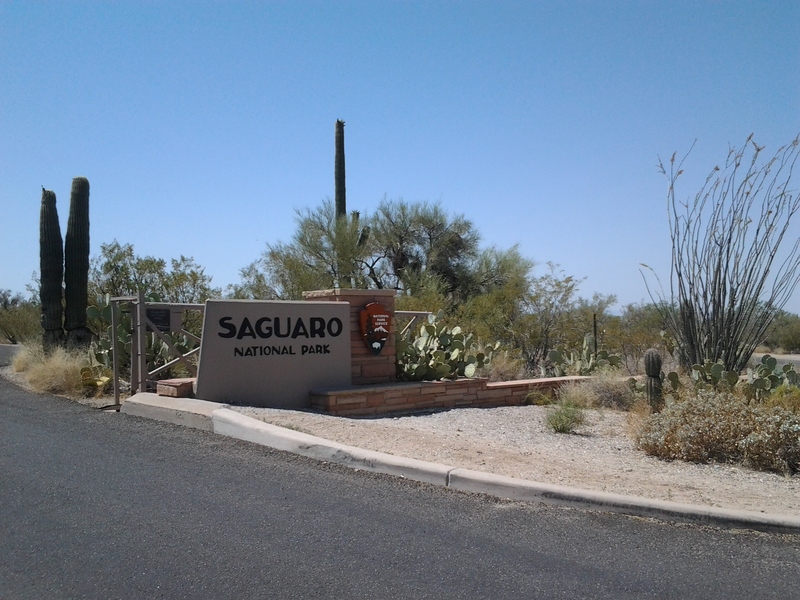 While visiting the park it feels like we arrived in some exotic place hidden in the Sonoran Desert. 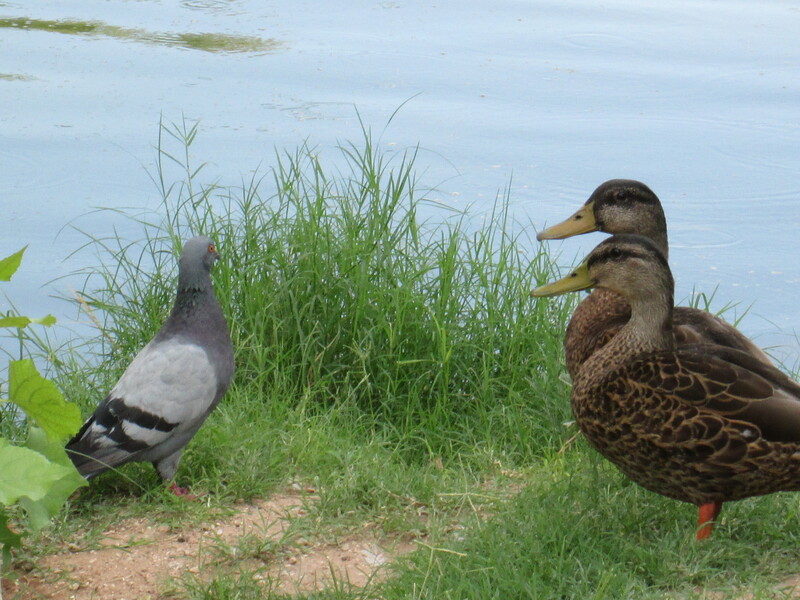 The ducks, birds and turtles entertain us at our picnic table while we wait for the Tucson sunsets. 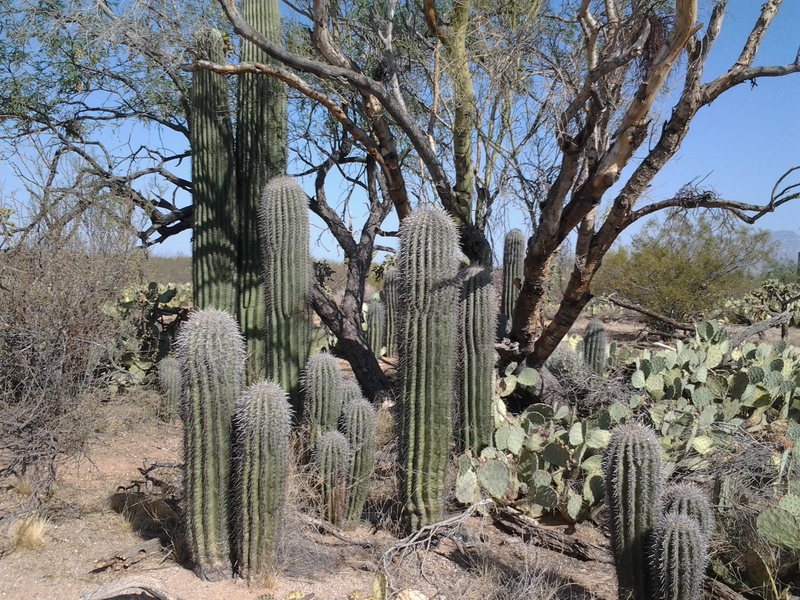 It is a wonderful reprieve from the heat and definitely not what you would expect to find in Tucson, Arizona. Adding to its charm, professional photographers frequent Agua Caliente with clients who want a stunning background. There is a huge mesquite tree east of the ranch house estimated to be over 250 years old! To sustain this elderly mesquite tree, Agua Caliente’s administration use brick columns and steel poles to support the enormous branches. Agua Caliente Park is listed on the National Register of Historic Places. 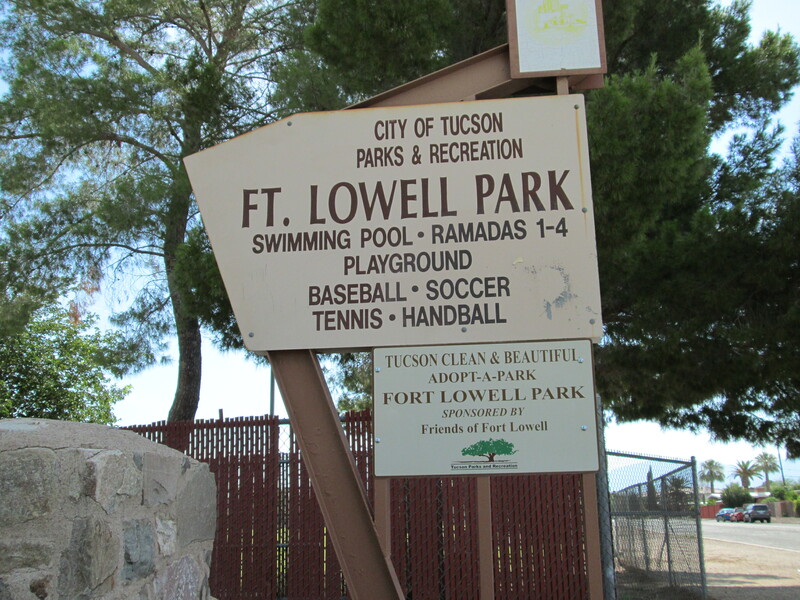 This extreme east Tucson park is truly an oasis in the desert and is highly recommended for you, your family and friends. Drive northeast of the Tucson city limits and you will discover a natural spring surrounded by wildlife, palm trees and native vegetation. Agua Caliente Park transports a visitor from the Sonoran Desert to a 101-acre hidden oasis. Agua Caliente, (hot water) is named for the warm water spring that supports several ponds within the park. Agua Caliente Park has an open lawn edged by tall Date Palms, and a stream bank lined with mature California Fan Palms close to 100 years old. Human habitation at Agua Caliente has been found to date back about 5,500 years. I’d like to share a simple history and insights into the rich farming and ranching of the unique desert oasis called Agua Caliente. From A.D. 600 to 1450, the prehistoric Hohokam constructed one of the largest and most advanced irrigation networks ever created using pre-industrial technology. This technology would eventually give form to the unique prehistoric culture of southern Arizona known as the Hohokam. 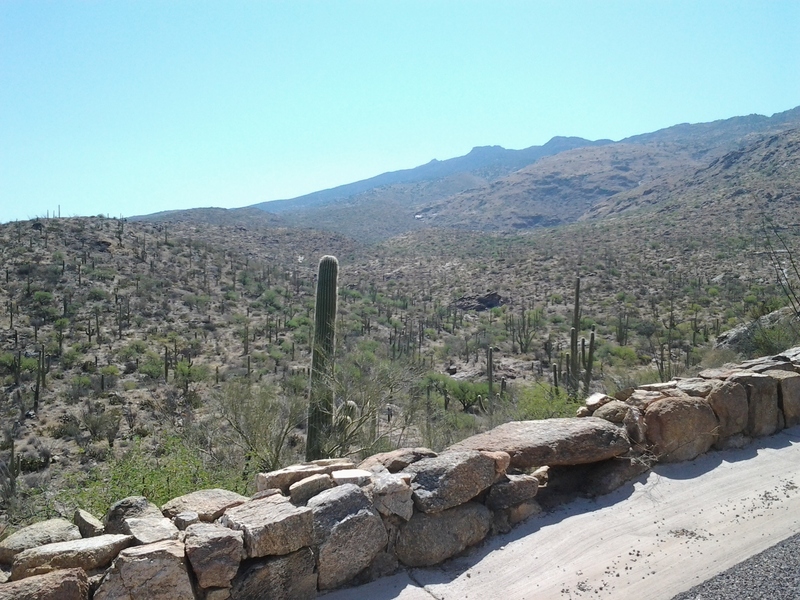 Around 1150 AD, a Hohokam village, referred to as the Whiptail Site, was established that extended into a portion of Agua Caliente in the Tucson basin. Deserving of our respect, the incredible Hohokam were able to sustain life in the area of Agua Caliente for nearly 1,500 years. The hot spring at the Whiptail Site at Agua Caliente Park has attracted native settlers since about 2500 B.C. These facts are what has helped put the Tucson Basin on the map as one of the oldest continuously inhabited areas in North America. About 1853-1870s, Agua Caliente Spring was used as an army encampment following the Gadsden Purchase. What is the Gadsden Purchase? **James Gadsden was the U.S. Minister to Mexico who was sent to renegotiate a border with Mexico that provided a route for a southern railroad in exchange for U.S. financial obligations. In 1873, Peter Bain filed the first formal claim to 160 acres surrounding Agua Caliente Spring. He began a dairy cattle operation by bringing cows north from Sonora. 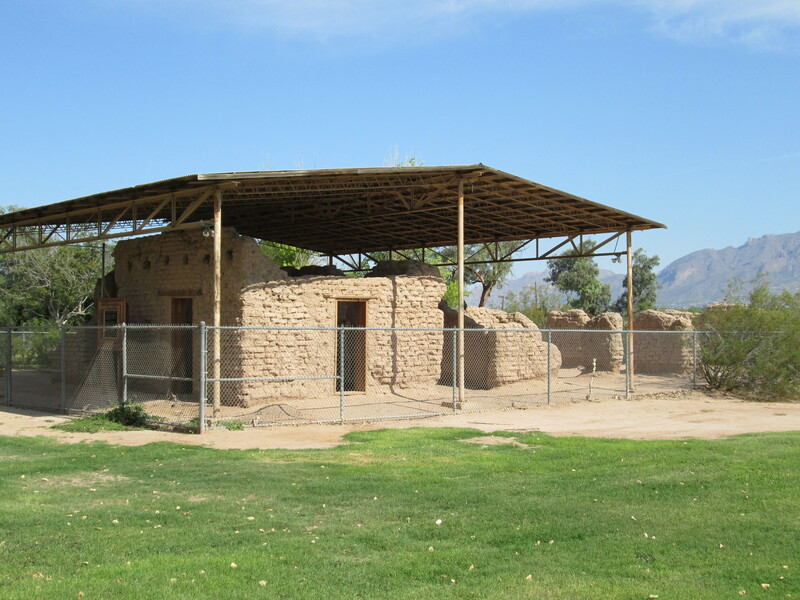 Bain built a house, several outbuildings and corrals at Agua Caliente. 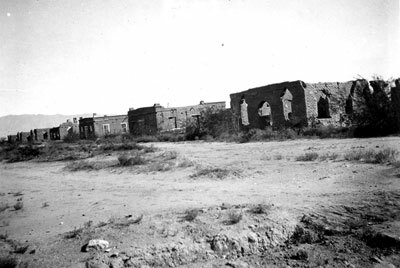 In 1875, James P. Fuller purchased “Agua Caliente Rancho” and established an orchard and cattle ranch on the property. In 1881, Fuller’s Hot Springs Resort was advertised as a medicinal and recreational destination. He promoted the curative properties of the natural warm springs. 1880s-1920s. Various owners operated Agua Caliente as a cattle ranch and resort. The ranch bunkhouse, which dates back to the 1920s, was used by the ranch hands. The ranch house, caretaker cottage, now known as Rose Cottage, and the bunk house have been restored. The ranch house depicts the home as it may have appeared in the 1920s. In 1935, Gibson DeKalb Hazard purchased Agua Caliente and operated it as a working ranch while also growing fruit and alfalfa. In 1951, the Filiatrault family took over the ownership of Agua Caliente consisting of three large lakes. 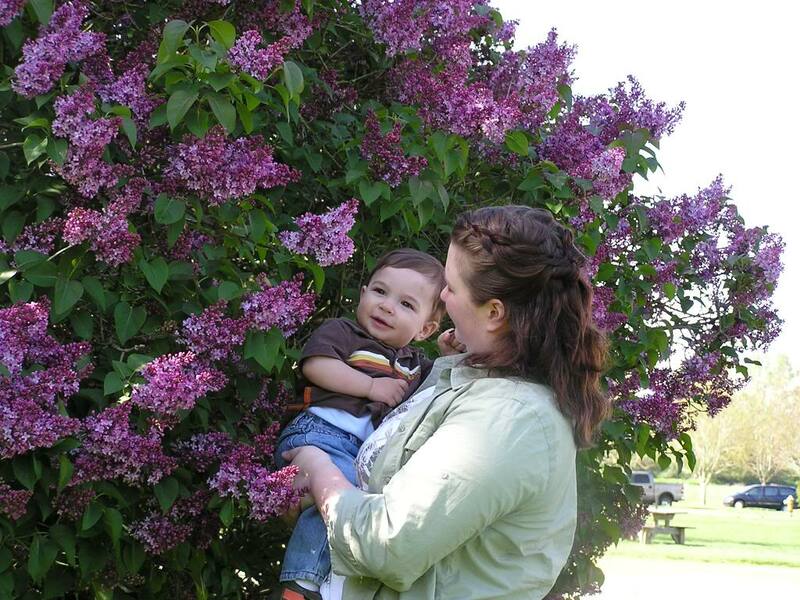 They also grew alfalfa for their cattle and horses and maintained the fruit orchard Fuller established in 1875. In 1984, local businessman Roy P. Drachman donated over $200,000 toward the purchase of Agua Caliente. The donation provided the incentive for Pima County to acquire the property and establish Agua Caliente Park. 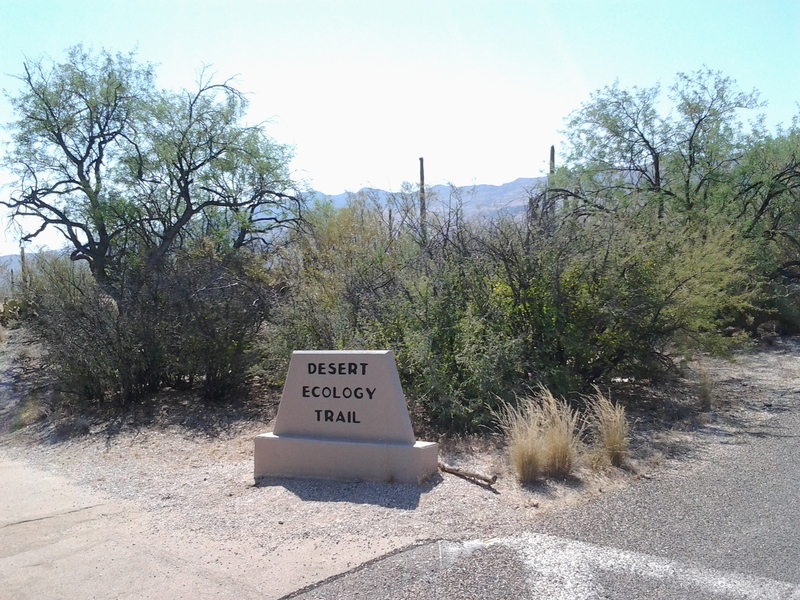 Agua Caliente Park, a Pima County Natural Resources, Parks and Recreation Facility, opened on January 19th, 1985. March 1, 1997. Agua Caliente’s expansion areas were opened for public use. 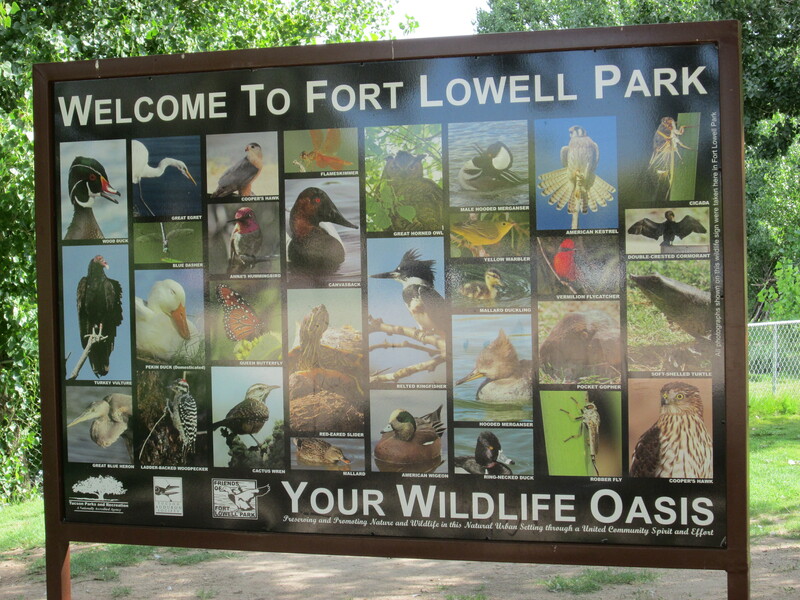 The park improvements included a paved entry drive and parking lot, accessible trails, interpretive signs explaining the waterfowl and history of this unique park, and a new maintenance building. The ranch house was built around 1873 and is currently a visitor center and an art gallery. Call 520-749-3718 for more information. Curve-billed Thrasher – AZ desert birds with personality! With their long tails, melodious songs and zesty personalities, the Curve-billed Thrasher is one of my favorite Arizona birds. Each bird possesses its own charisma. And sing…? Oh yes this bird can sing! The Curve-billed Thrasher, Toxostoma curvirostre, is a common bird species of the Sonoran Desert. These desert birds are grayish, brown with a long tail and faint spots on the chest. An adult Curve-billed Thrasher has vivid orange or red-orange eyes. Juvenile birds have lighter yellow eyes. Have you seen a Curve-billed Thrasher (Toxostoma curvirostre)? Then you’ve already witnessed their daring personality and fondness for charging into groups of birds provoking chaos. This Southwest bird is a ground lover. Curve-billed Thrashers fly in abrupt jerky fashion from bush to bush. They especially like areas with thorny mesquite trees or cholla cacti. This bird probes the dirt and leaf litter with its long, black, down curved beak. While digging holes in the soil, the Curve-billed Thrasher flicks aside debris in search of seeds and insects. In worker fashion, Curve-billed Thrashers use their robust legs and feet to shuffle through the plant litter beneath a cactus or shrub. In the U.S., this bird occurs most commonly in the southern parts of Arizona, New Mexico and western Texas. Most of the country of Mexico is blessed to enjoy the sights and songs of the Curve-billed Thrasher. This male and female thrasher look very much alike. Immature birds are similar to the adults but with shorter, straighter bills and yellow instead of orange-red eyes. It is the custom of this long-lasting pair of birds to mate in the winter after a charming courtship filled with song. Beginning early spring the two birds cooperate in building a nest; creating a deep bowl-shaped structure lined with long, thorny twigs. Curve-billed Thrashers prefer the lower shaded branches of the cholla cacti; while the Cactus Wren bird will build a ball-shaped nest on a higher cholla cactus branch. Breeding usually takes place from May to mid-July. The female Curve-bill Thrasher lays her spotted bluish-green eggs early in the morning on successive days, usually producing a total of 3-5. The eggs hatch in about fourteen days. The young birds will leave the nest, approximately, six weeks after the female produces her first clutch. For the next several weeks, Curve-billed Thrasher parents nurture the fledglings, still answering their cries for food but teaching them foraging to encourage their independence. 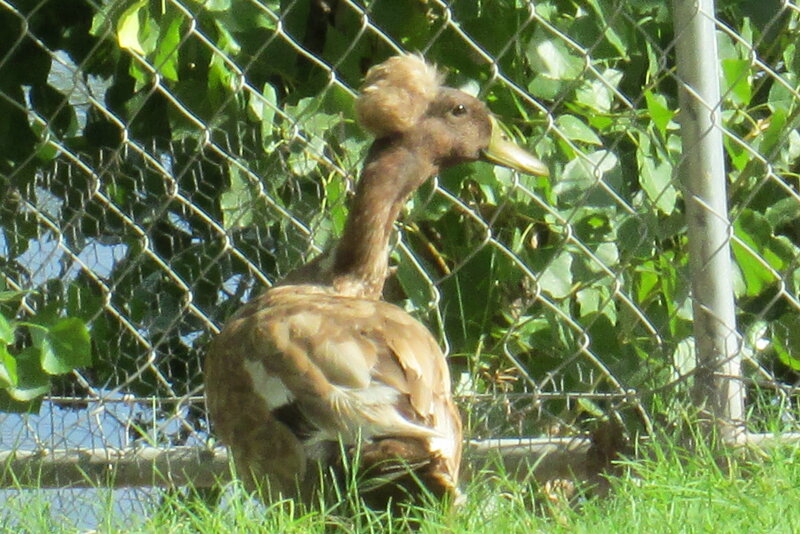 Unfortunately, this bird has lost a considerable part of its south Texas brushland habitat. And the expanding cities of Tucson and Phoenix are causing a rapid loss of habitat in Arizona. Although there has been little conservation work directly focused on the Curve-billed Thrasher; much work has been directed at protecting habitats in some areas where the species occurs. Author tjsgardenPosted on July 4, 2013 April 18, 2014 Categories Arizona Wildlife, Birds, Cactus, Succulents, Curve-billed Thrasher, Free Pictures, Mesquite Trees, Saguaro National Park, Tucson, Unique Garden ItemsTags Arizona, Arizona Birds, Bird, bird eggs with spots, bird nest in cactus, bird with orange eyes, bird with red eyes, bird with yellow eyes, Birds, birds of Mexico, birds of Phoenix, birds of Tucson, birds that bounce around, birds that pound on the ground, birds with long bill, birds with long curved beak, black pointy beak, blue bird eggs, blue green bird eggs, Cactus Wren, Cornell Lab of Ornithology, Curve-billed Thrasher, desert bird, eBird, nest in Cholla Cactus, Sonoran Desert, southwest birds, Thasher birds, Thrasher9 Comments on Curve-billed Thrasher – AZ desert birds with personality! The Shade from this Thornless Chilean Mesquite, Prosopis chilensis, creates a 10-15 degree cooler temperature in our yard. The dogs use the shade from the Mesquites to stay cool. 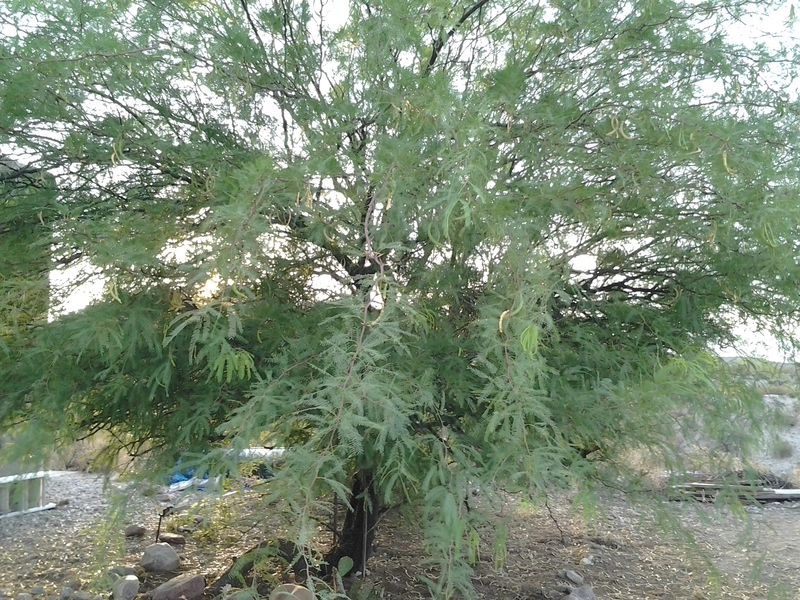 Below in the photo is a Hybrid Mesquite that is Thornless, called the Chilean Mesquite. By providing abundant shade, a lush green leaf canopy and graceful fissured brown trunks, Thornless Mesquites are another of the wonderful trees that dispelled the myth that desert landscapes were hot, barren, spiny and uninviting. 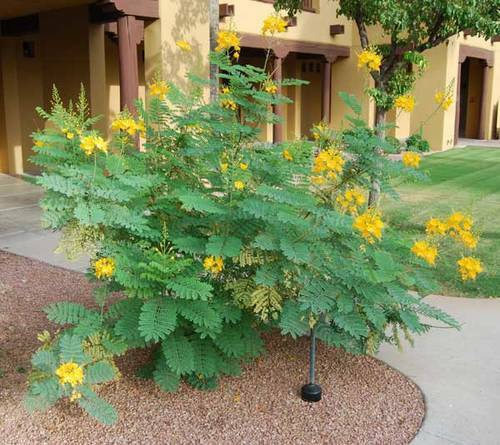 Chilean or Thornless Mesquite trees are beautiful and one of the best shade trees for your yard. 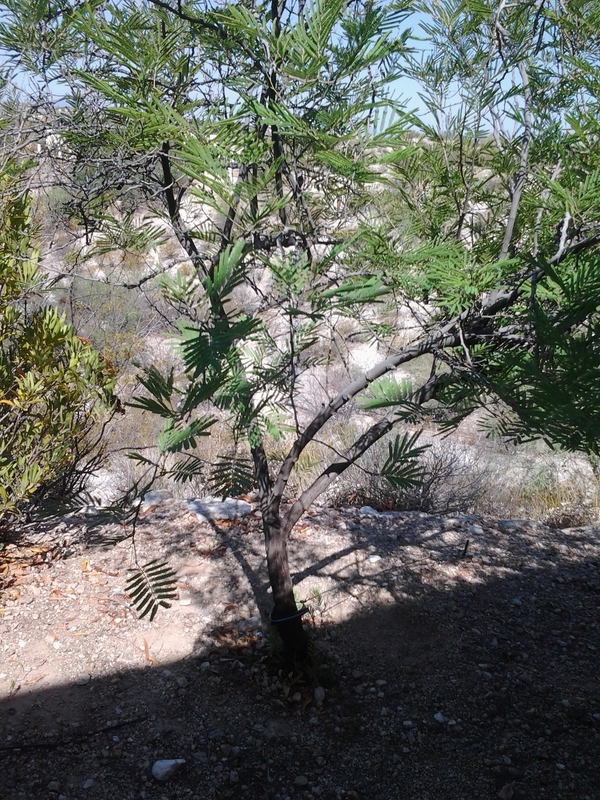 The Thornless (Chilean) Mesquite Tree pictured here is approximately 15 years old. Shade is a welcome addition to all desert landscapes, xeriscaping, especially in the extreme heat of The Sonoran Desert. The shade produced by Thornless Hybrid Mesquites, (Chileans) can range from filtered to quite dense which can inhibit the growth and flowering of some under-story plantings. When deciding where to grow your Mesquite Tree, consider the ultimate shade that can be produced by these trees and how it will affect the growth and flowering of under-story plants. 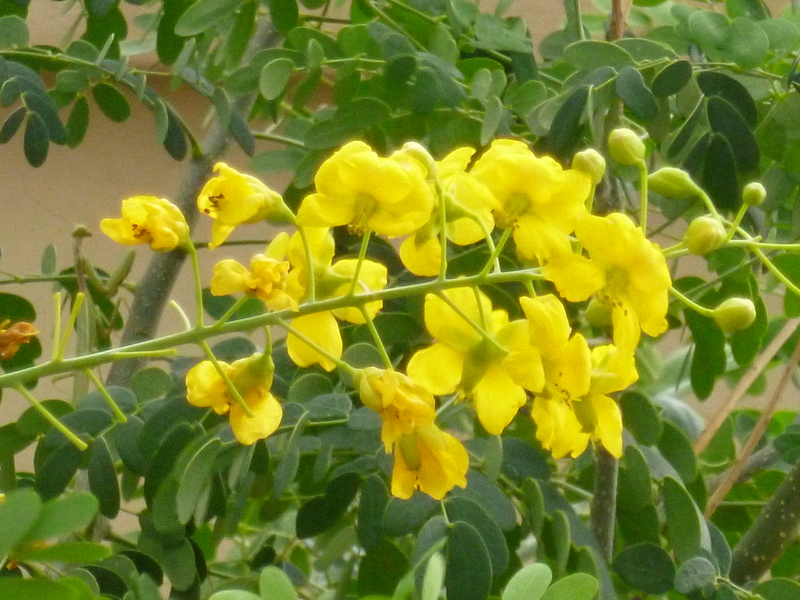 Also note from my experience that any plant, vine, or flower placed too close to the Mesquite will not do well. 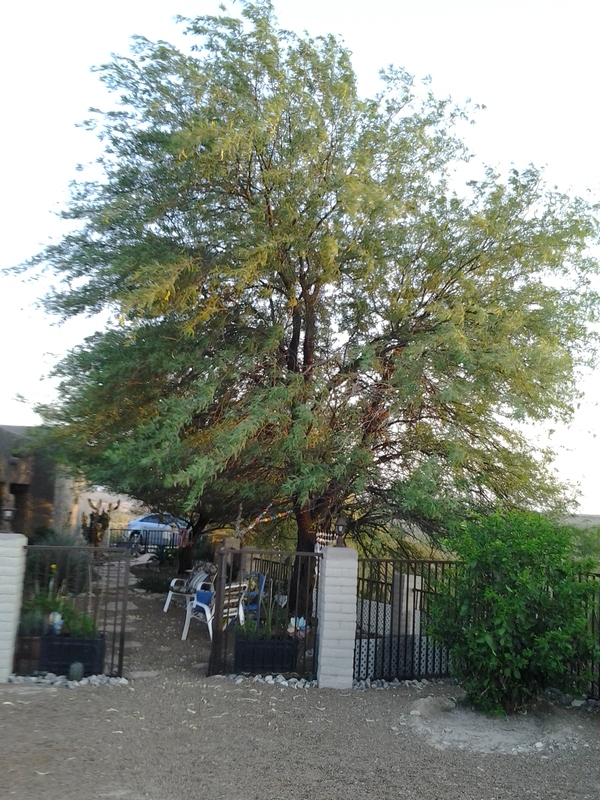 The Shade from this Mesquite Tree creates a 10-15 degree cooler temperature in our yard. At maturity, Chilean Mesquites can be up to 30 feet tall and as wide…with dome-shaped, spreading canopies, this Hybrid in the photo below is much taller. They are cold resistant to 10 to 15 degrees F. Thornless Mesquites are semi-deciduous, losing a portion of their leaves in warmer winters in the Phoenix, Arizona and Palm Desert, California areas. Las Vegas and Tucson, Arizona will have a little more leaf shed due to the lower winter temperatures. Leaves remaining through the winter are shed rapidly in spring just prior to bud break. 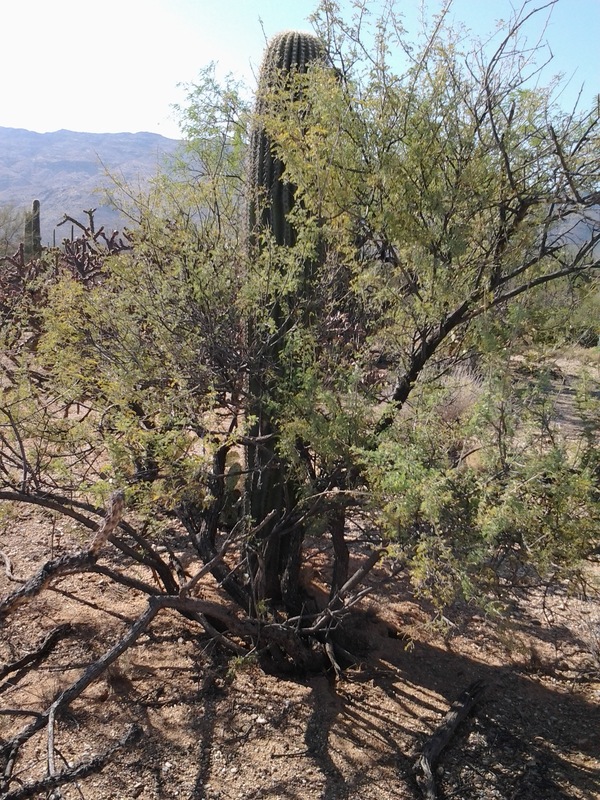 Mesquite trees are often easily damaged or completely uprooted by the high winds associated with the summer rainy season. Proper tree staking is essential!! 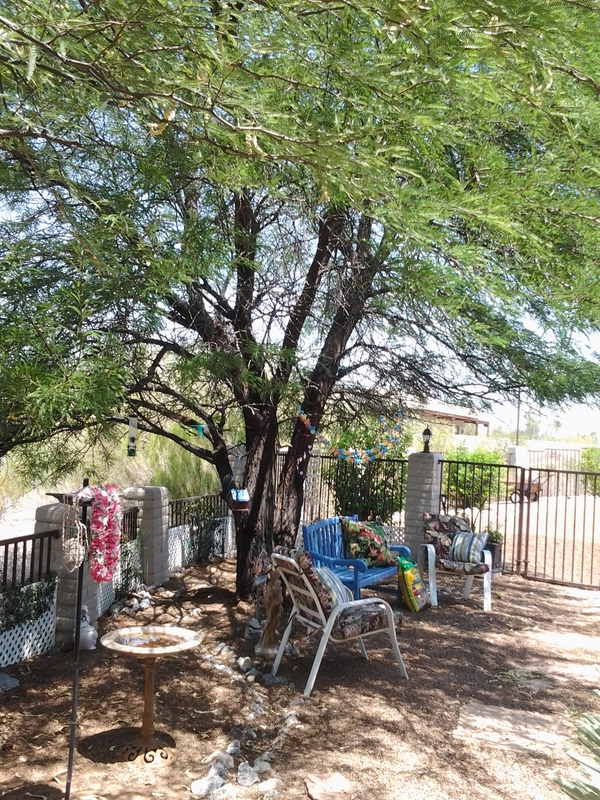 Below is a picture of our 15 year old Chilean Mesquite Tree, majestic, healthy and strong. This Tree is one of, if not the tallest Mesquite Tree, or any tree in our area. The Best Shade Tree. The wind was blowing during the photo. 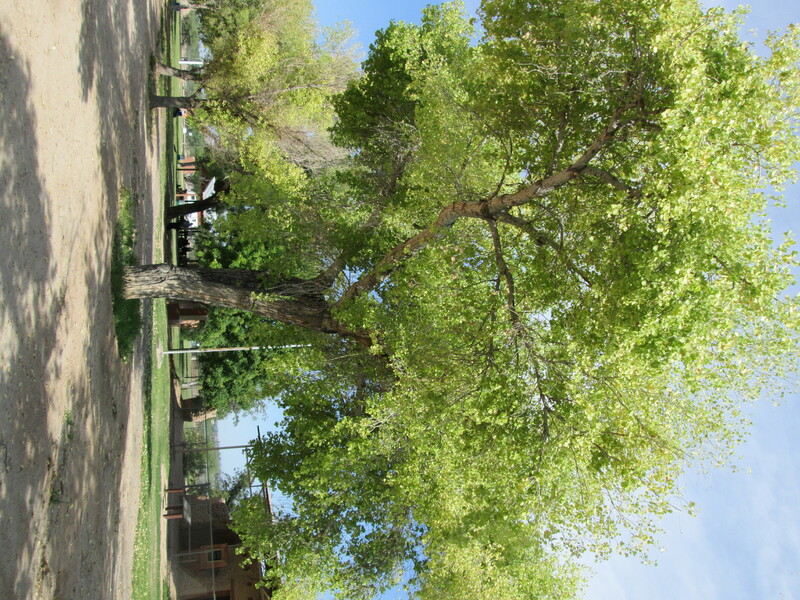 When it comes to shade – this Thornless Mesquite is the perfect tree for shade! It is also loved by the neighborhood birds.